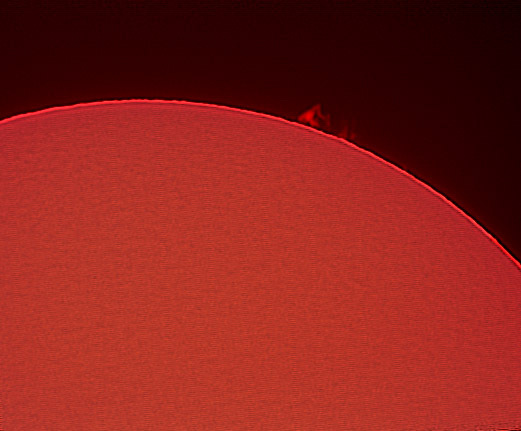 Sequence is Date - latest images are on top. 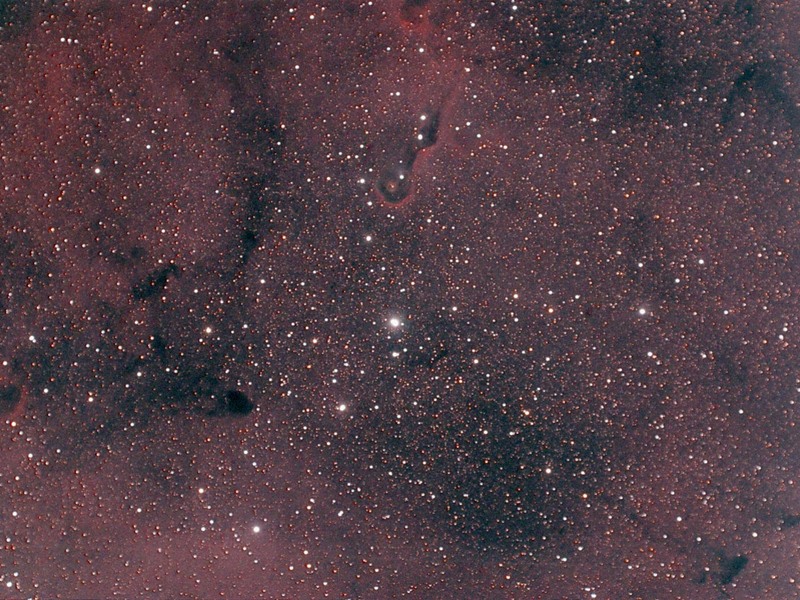 Chameleon Dust Clouds and Reflection Nebulas. 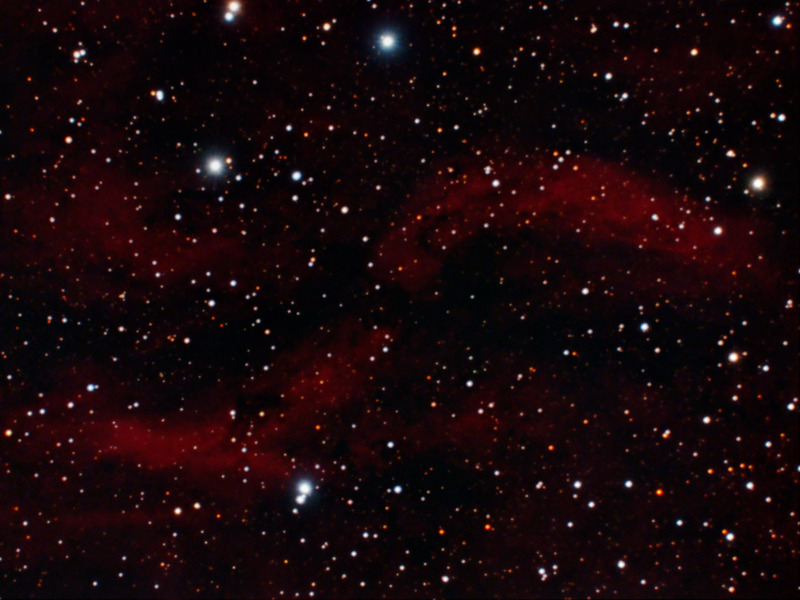 In this dusty area IC2631/Ced112, Ced110 and Ced111 are reflection nebulas. 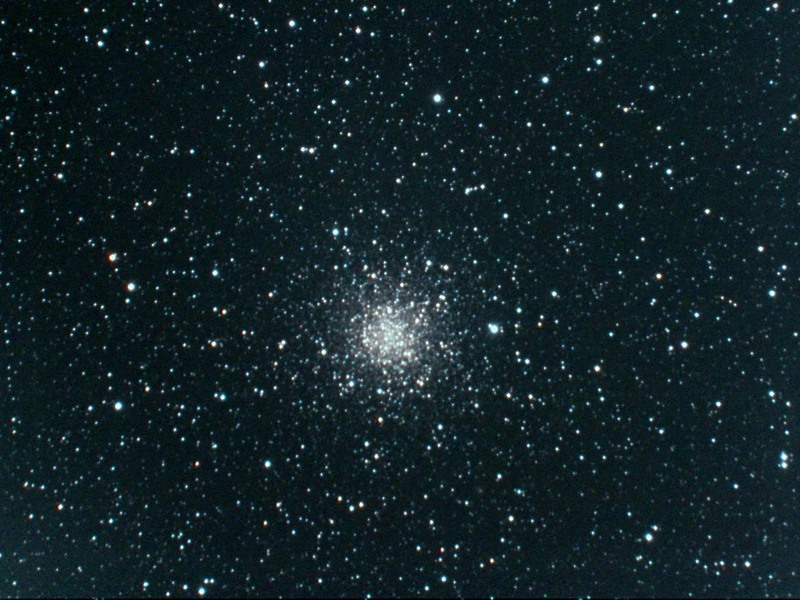 Their declination is strongly Southern (DEC -77), they can be observed exclusively from the regions of the southern hemisphere. 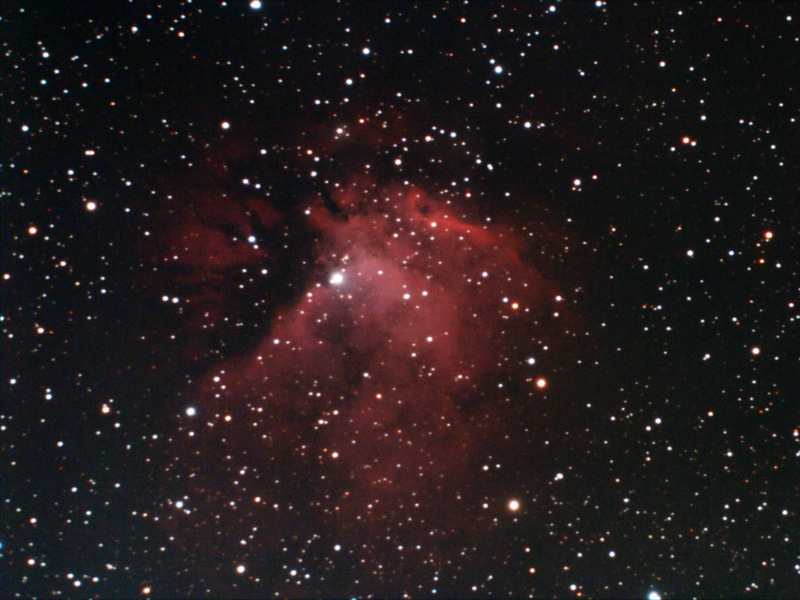 IC 2631 reflection nebula is the brightest part of the Chameleon molecular cloud in which the phenomena of star formation creating low-mass stars takes place . 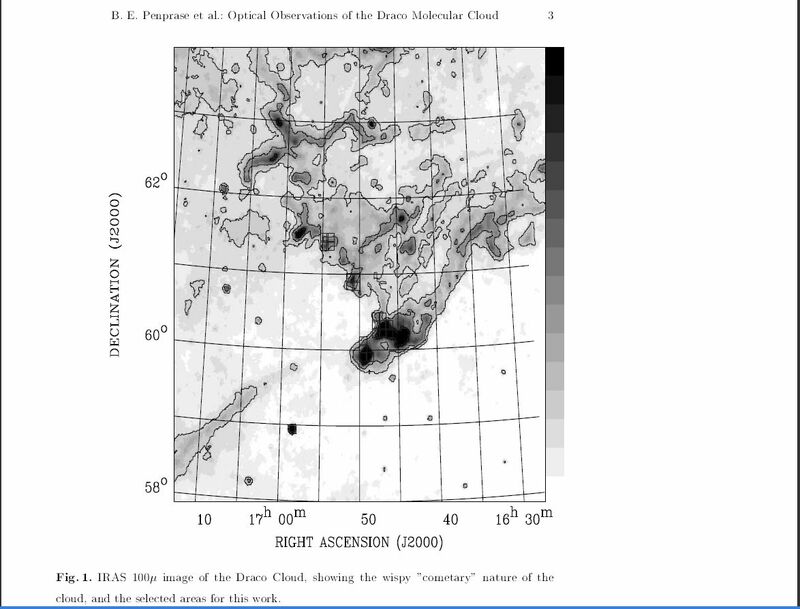 This cloud is of great importance in the study of the formation of planetary systems and brown dwarfs. 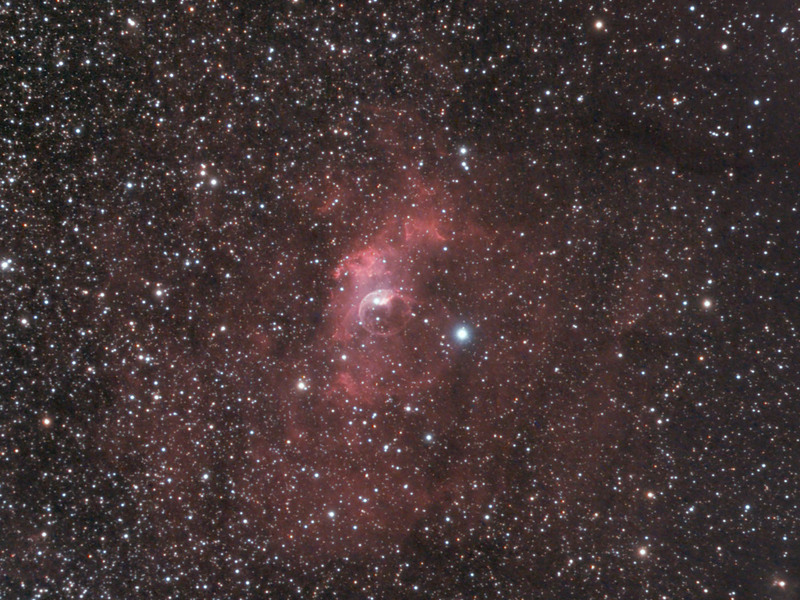 GN11.07.3 is the orange triangular nebula - an infrared nebula. 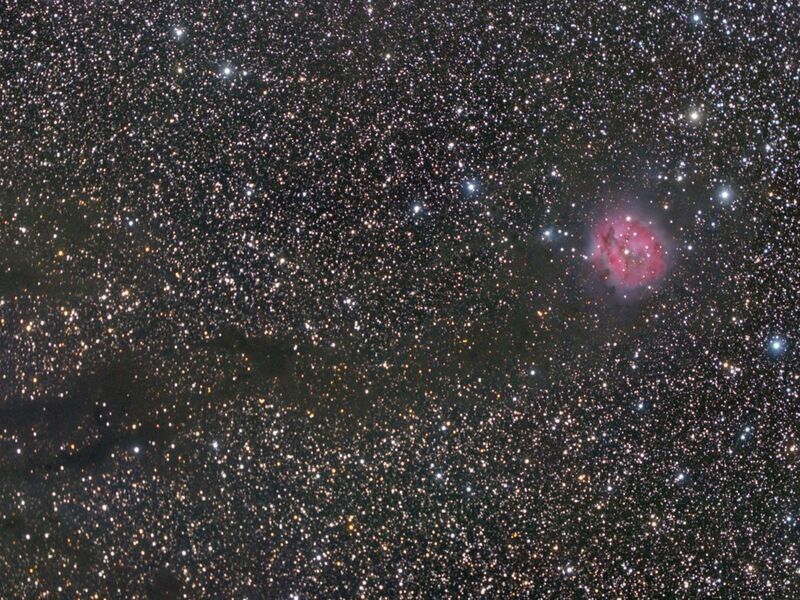 All images were exposed at Astrofarm Kiripotib Namibia May 30th 2014. 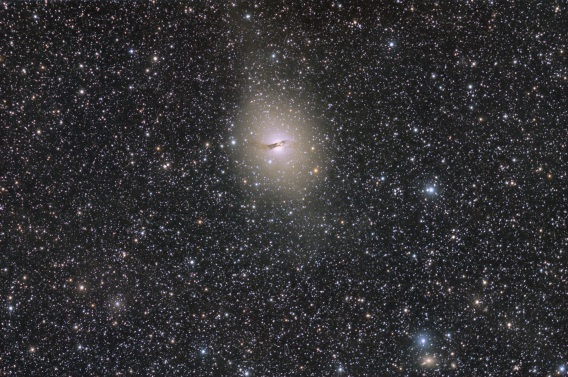 NGC5128 is one of the most interesting and peculiar galaxies in the sky, and is a strong source of radio radiation (therefore the designation Centaurus A); it is actually the nearest radio galaxy. 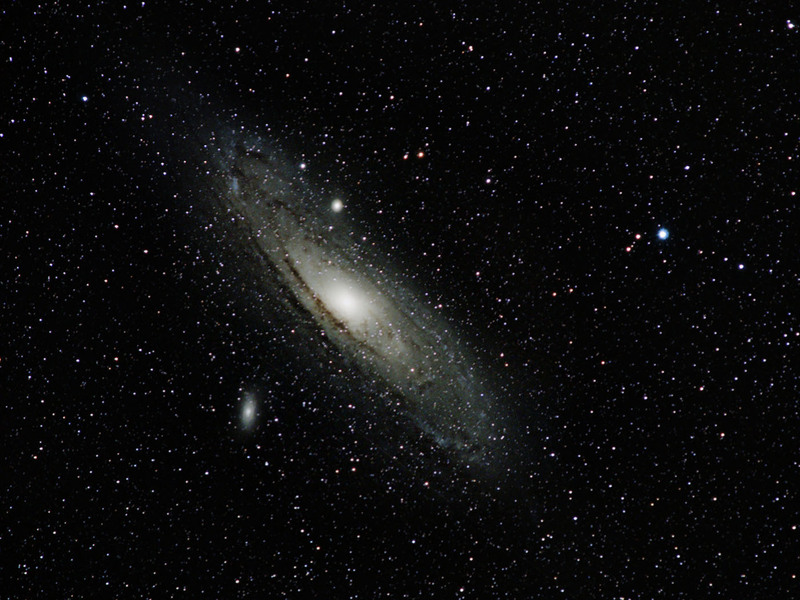 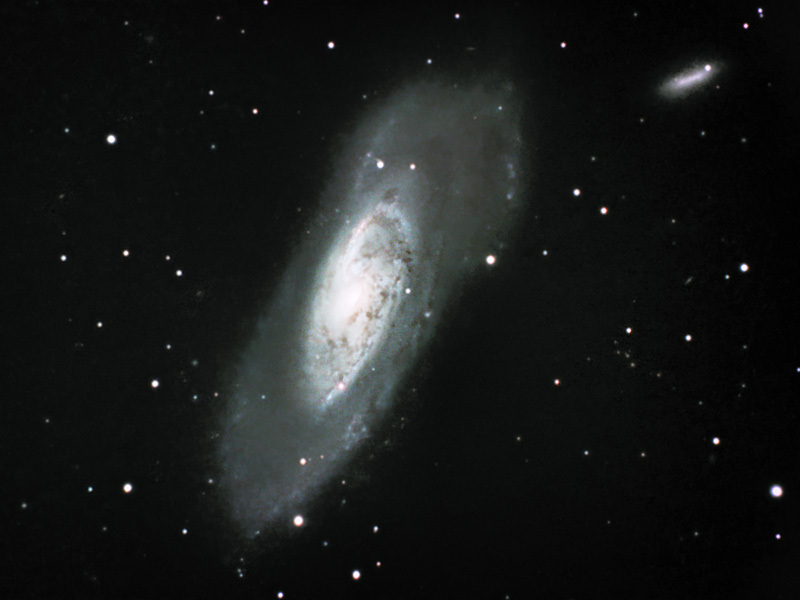 It is of intermediate type between elliptical and disk (spiral) galaxies: The main body has all characteristics of a large elliptical, but a pronounced dust belt is superimposed well over the center, forming a disk plane around this galaxy. 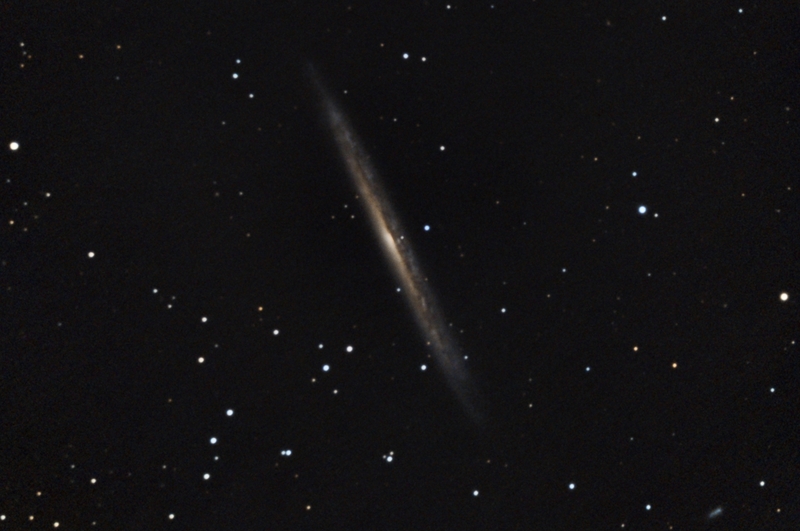 What we may very well be viewing is the early results of an giant elliptical merging with a much small spiral structure – creating a stunning halo. 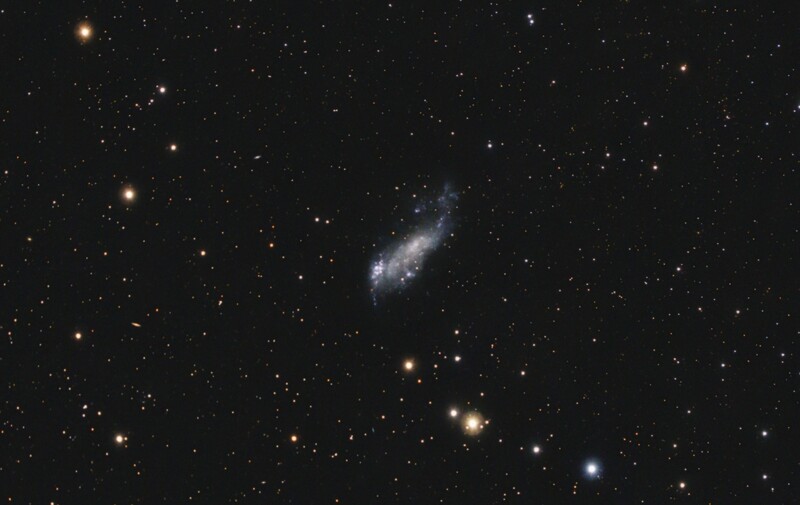 This adds a nice example in the local universe to the growing evidence that galaxy halos are built up from the accretion of dwarf satellite galaxies. 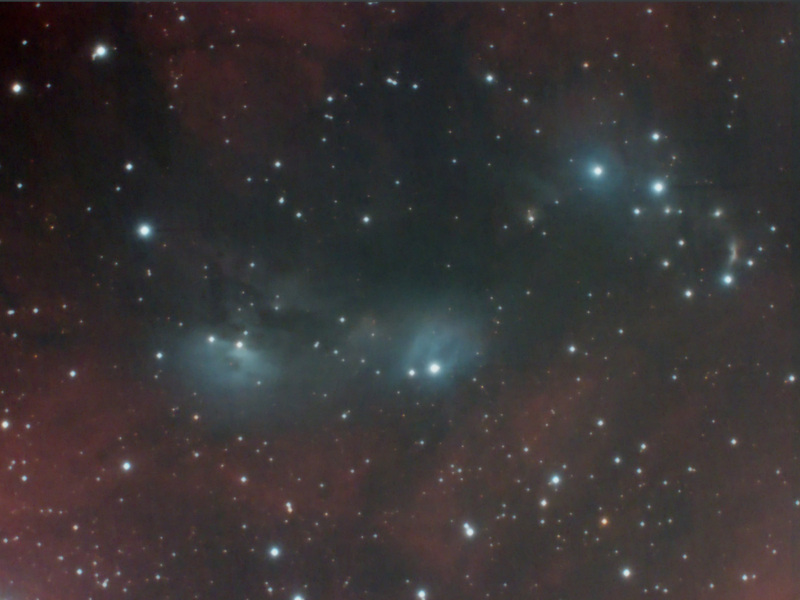 All images were exposed at Astrofarm Kiripotib Namibia May 28th 2014. 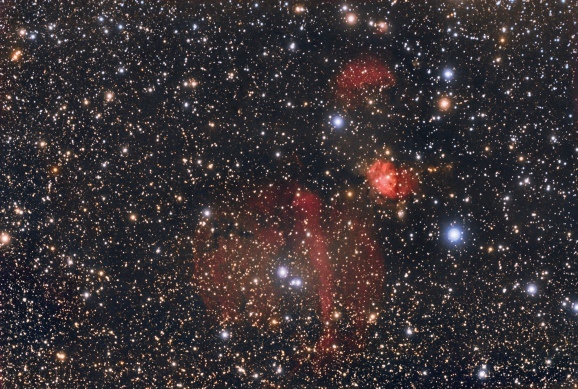 Reflection Nebulas VdB104 and part of IC4606 in Scorpius near Antares. 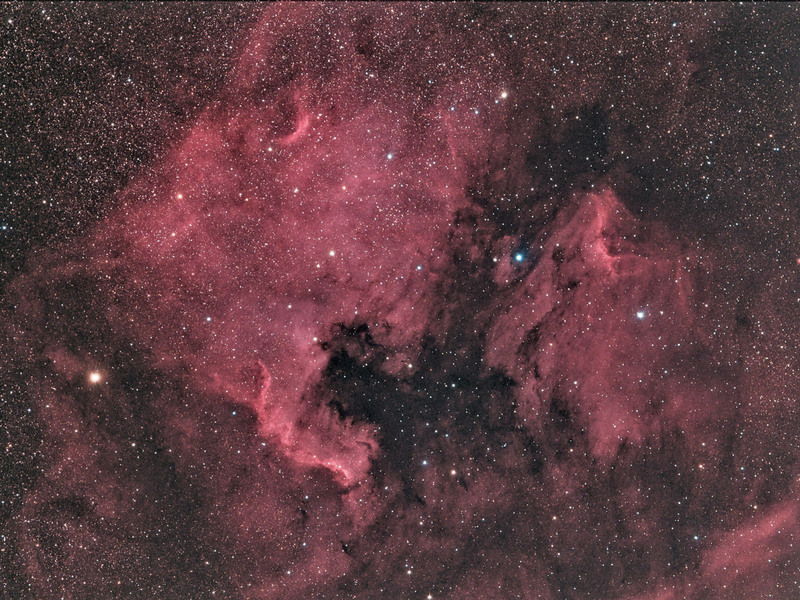 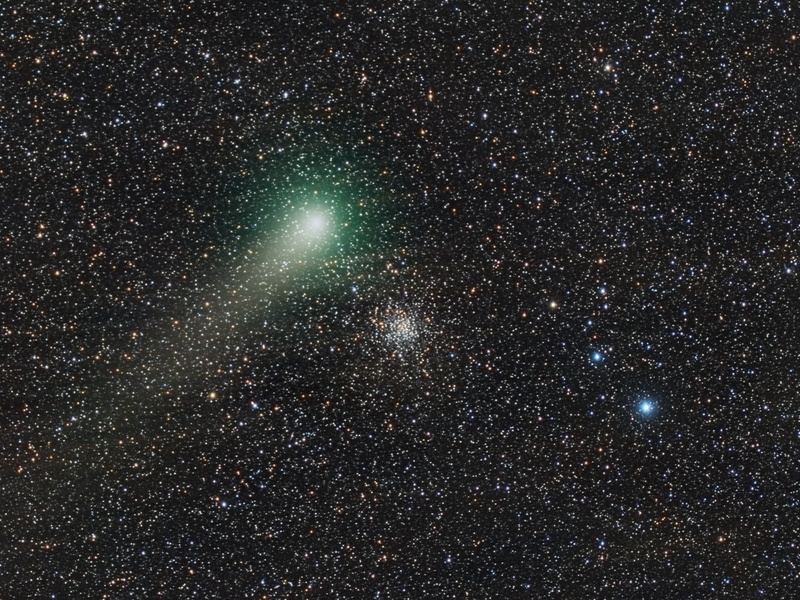 IC 4606 can be seen on the middle of the left part of the image. 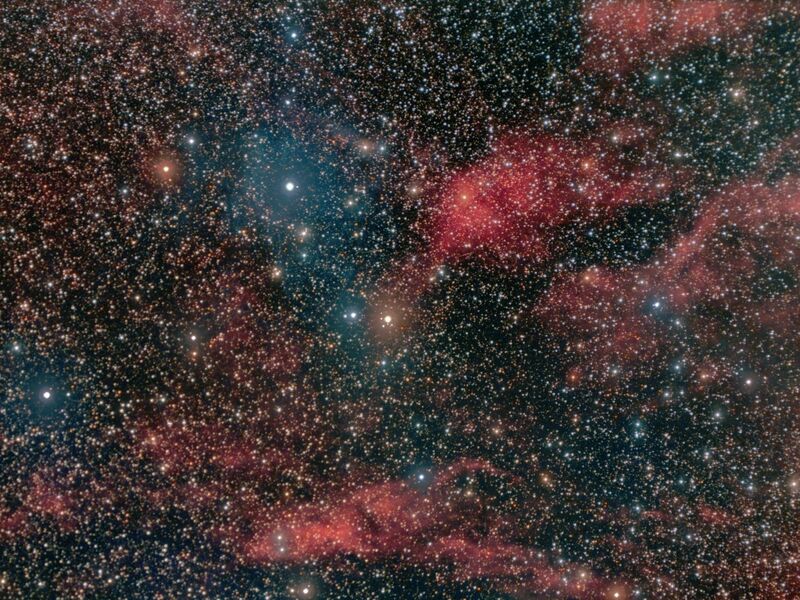 It surrounds the bright star Antares (left outside the image), known as the "Heart of the Scorpion". 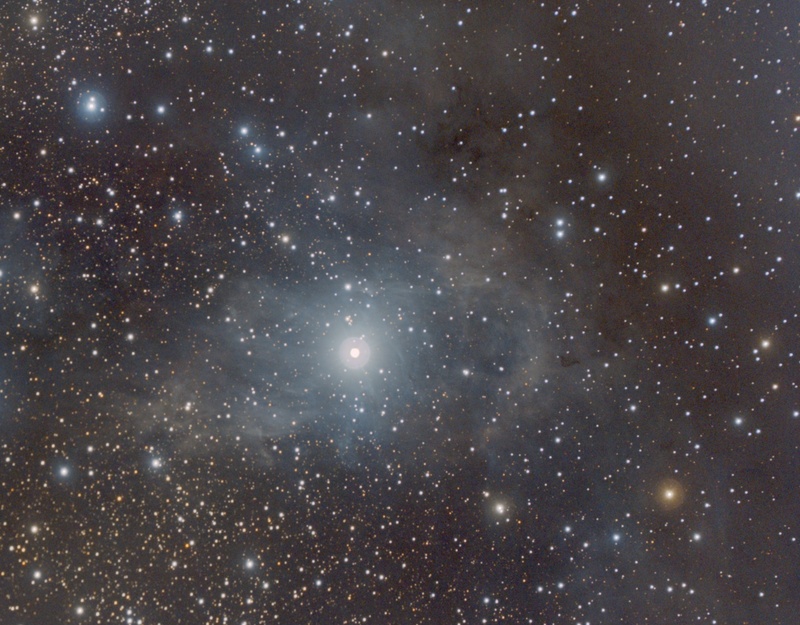 IC4606 is a yellow reflection nebula reflecting the light of Antares. 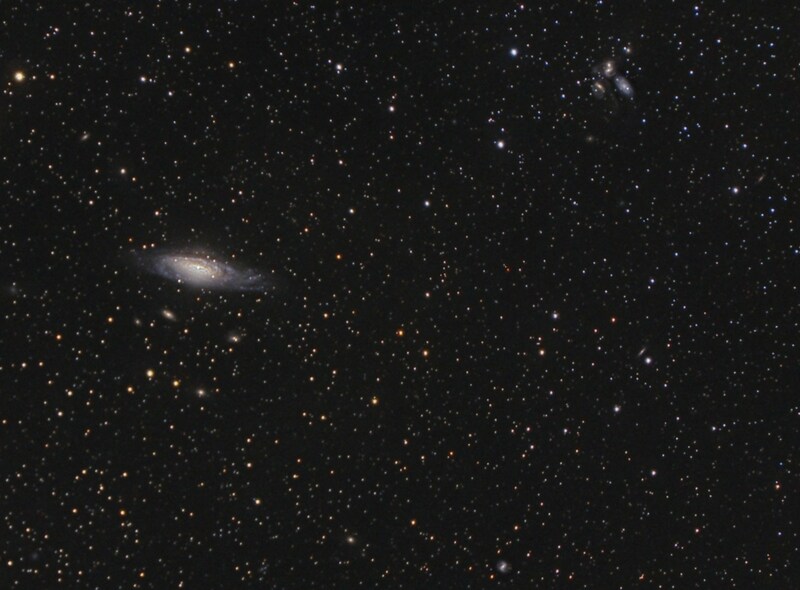 The more distant globular NGC 6144 (left middle) is a 10th magnitude globular star cluster that lies just to the north of it's famous neighbor, the globular cluster M4. 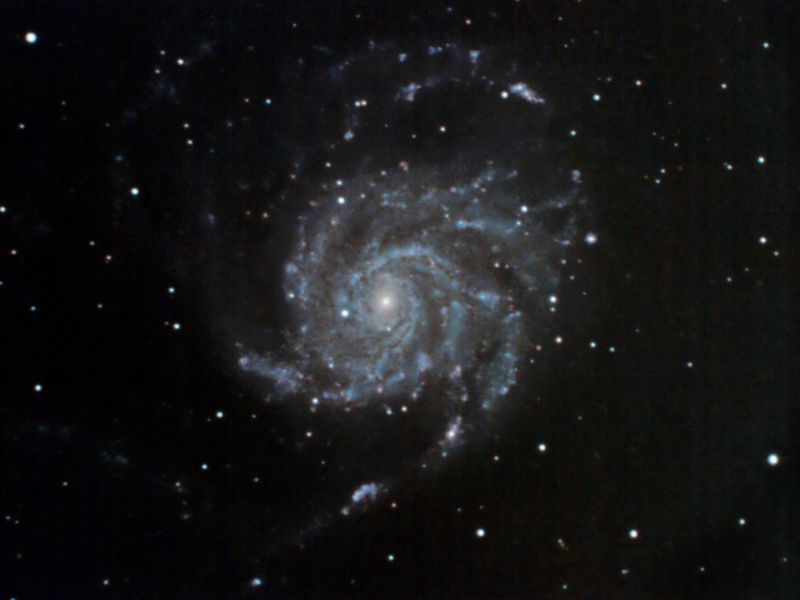 NGC 6144 lies 33,000 light years distant (three times farther away than the more nearby M4). 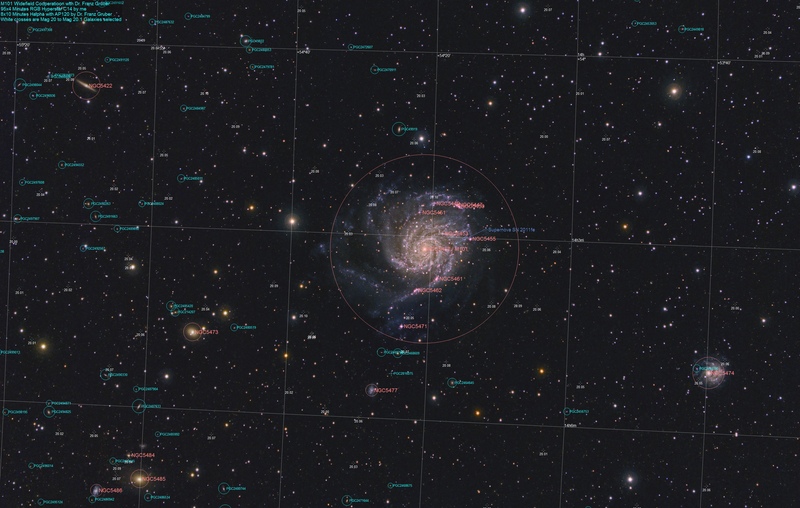 At that distance it also appears over three times smaller, 6.2' in diameter. 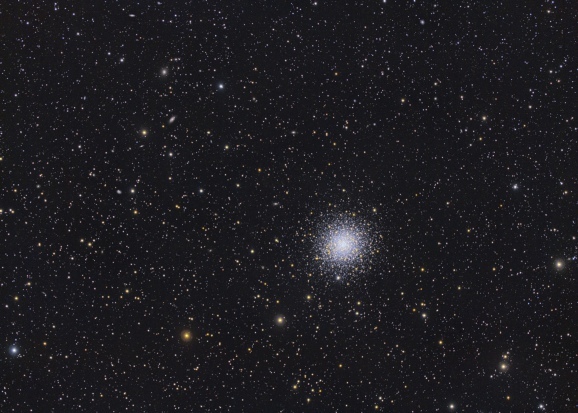 M4 is the bright globular cluster in the middle of the bottom. 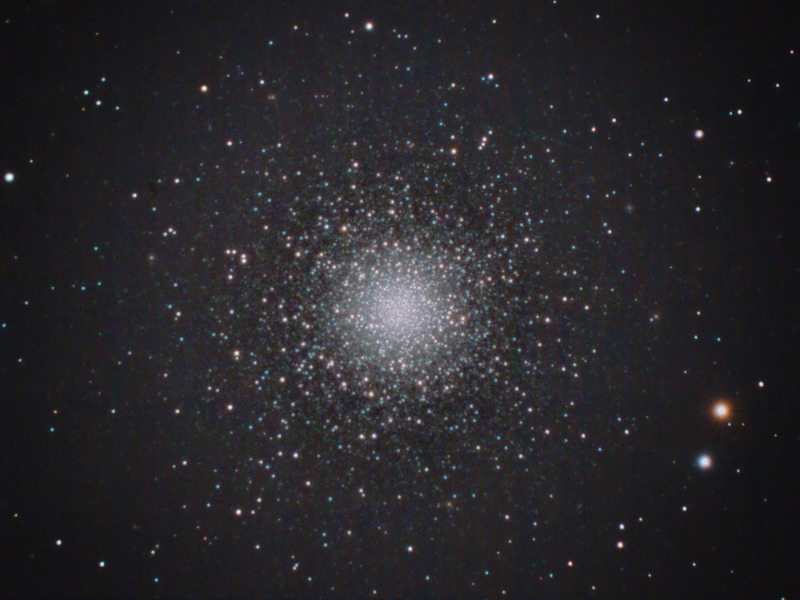 The reason why M4 is bright and large is simply due to its distance. 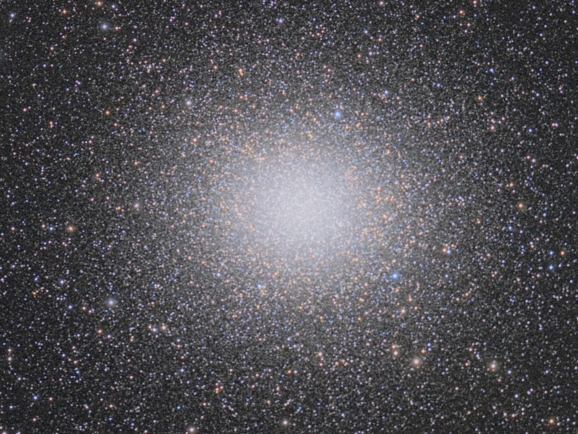 At only 7,200 light years, it's one of the closest globular clusters to Earth. 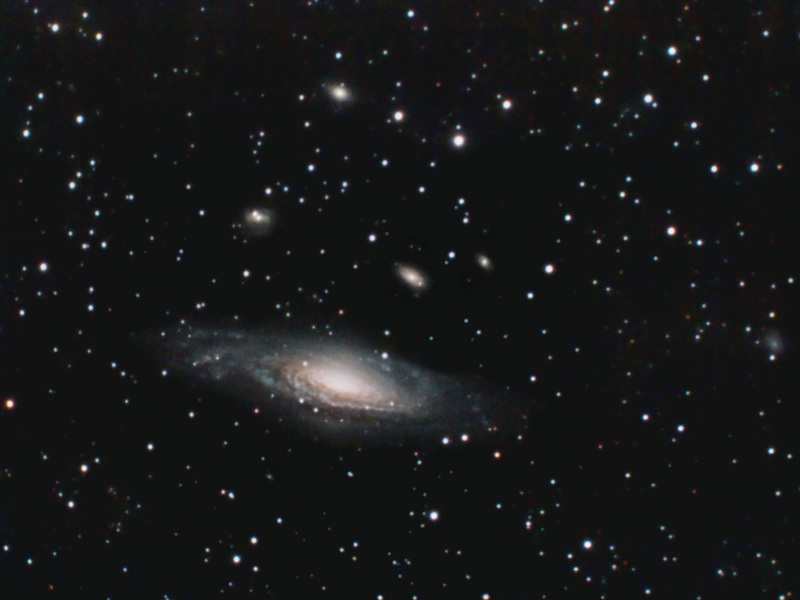 This image is a cooperation between Dr. Franz Gruber and me. 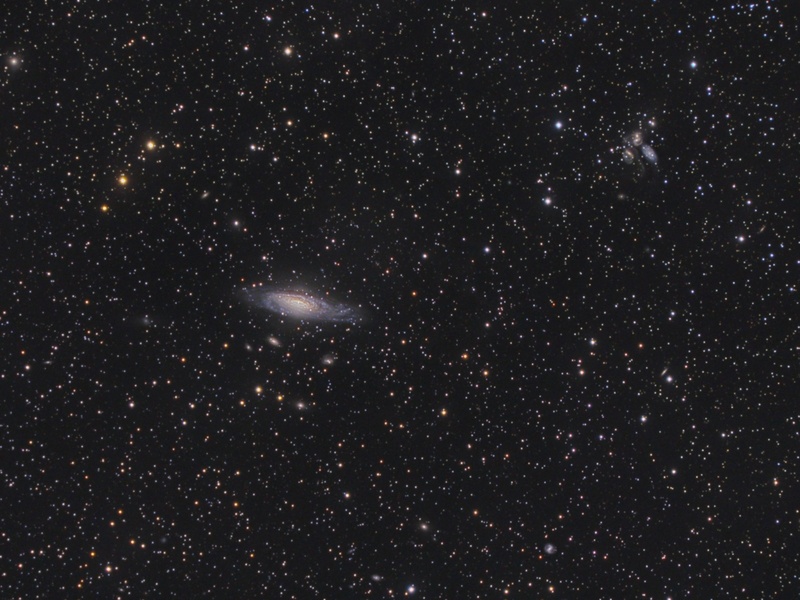 which are thin haze of gas and dust above our Galaxy's plane . 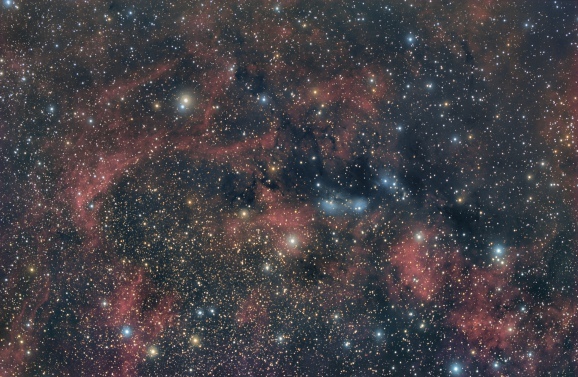 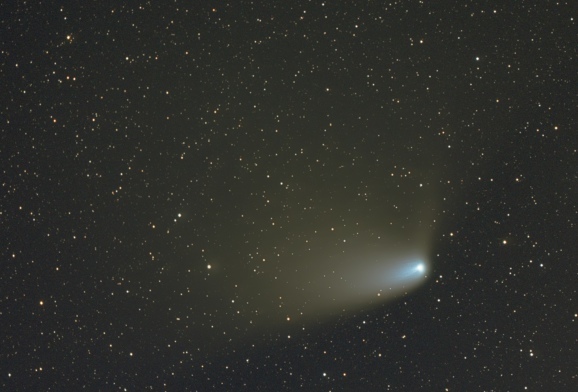 IC 4633 (left of the middle at top) is on the edge of the emission glow while just below lies the bright sliver of a distant edge-on spiral or lenticular system, IC4635. 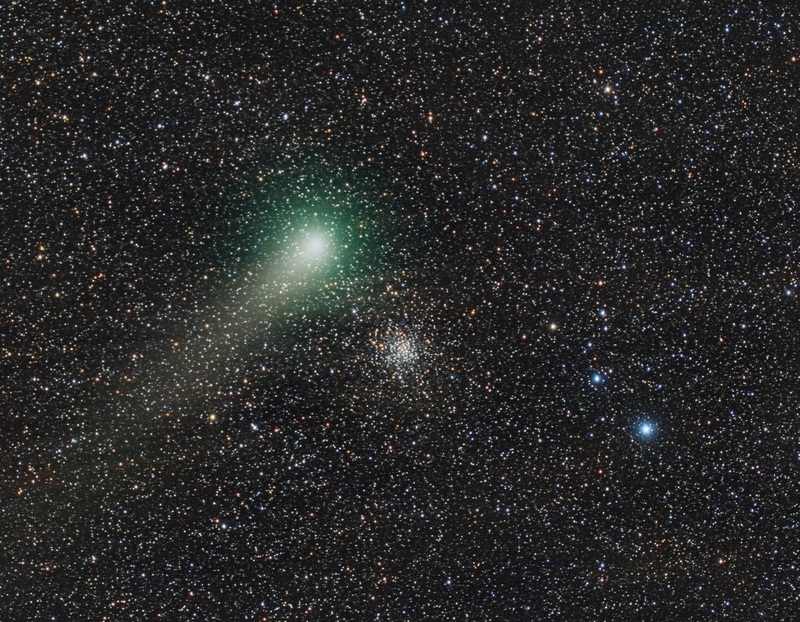 till May 28th 3:10 am 2014. 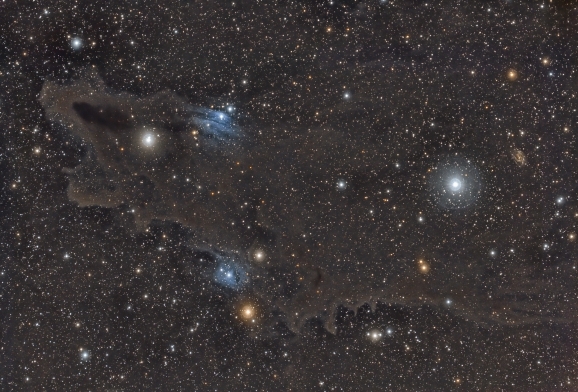 Reflection Nebula IC4606 (Yellow), Globular Cluster NGC6144, Part of Reflection Nebula IC4605 (Blue) , and the area North of Antares (The bright star in the top middle). 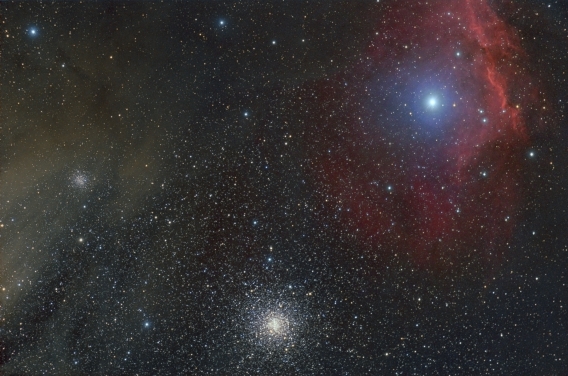 Antares is about 600 light years away. It is a first magnitude star 15 times more massive than the Sun, and tens of thousands of time more luminous.This star is about 700 times the diameter of the Sun. 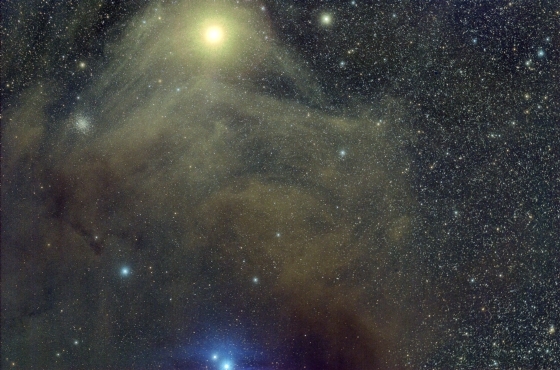 If Antares were to replace the Sun in the solar system, both the Earth and Mars would be inside the atmosphere of the star. 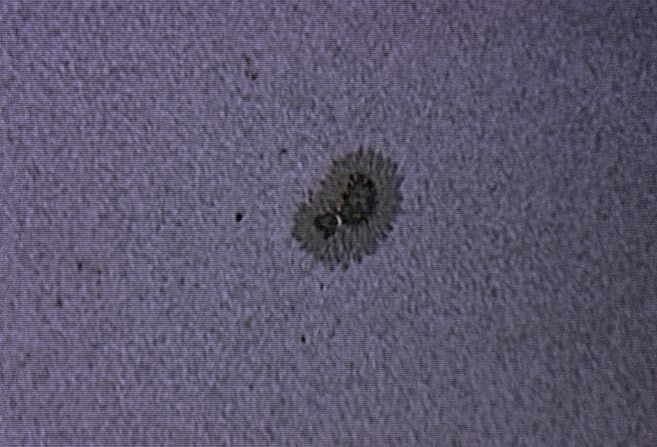 At its cool surface, tiny solid particles begin to appear, made from traces of heavier elements formed inside the star. 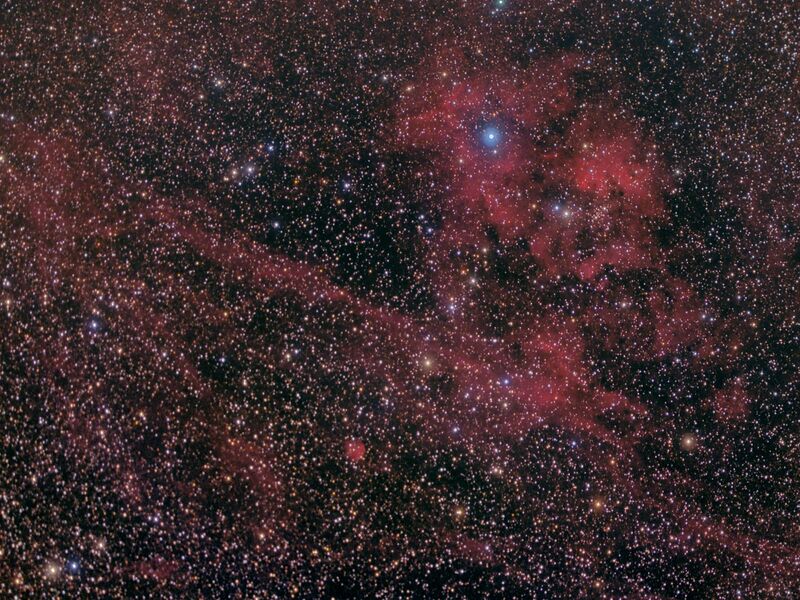 In this image the tiny dust grains drift away, reflecting Antares' yellowish light and making the wispy nebula that seems to envelop the moribund star, soon to be a supernova. 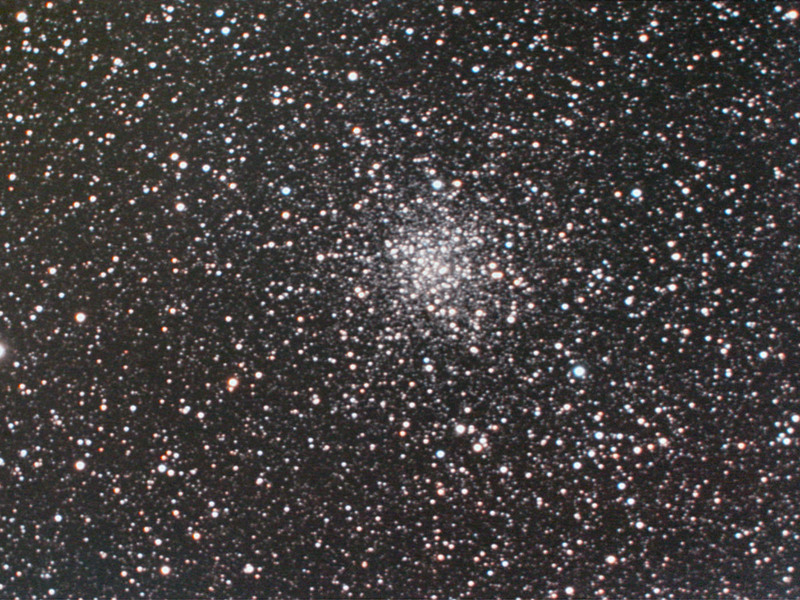 In the background is a globular cluster, NGC 6144, over 30,000 light years away. 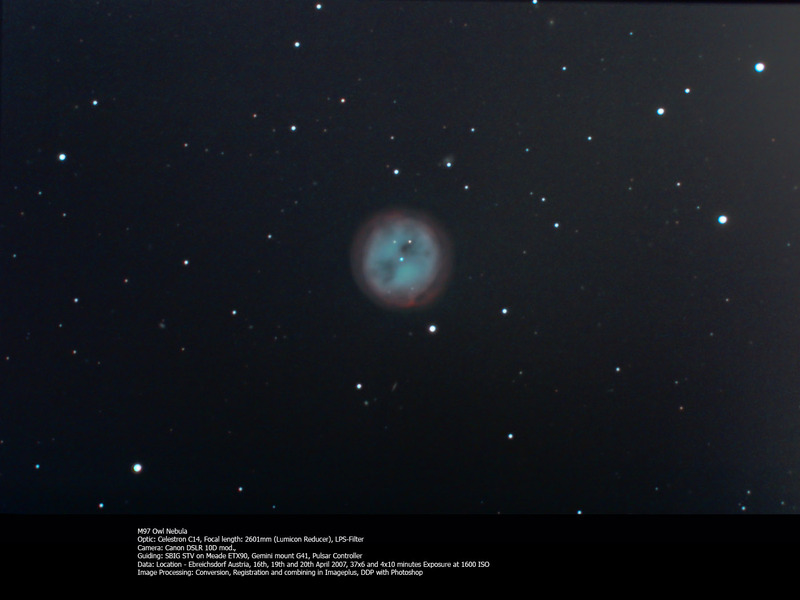 All images were exposed at Astrofarm Kiripotib Namibia June 1st 2014. 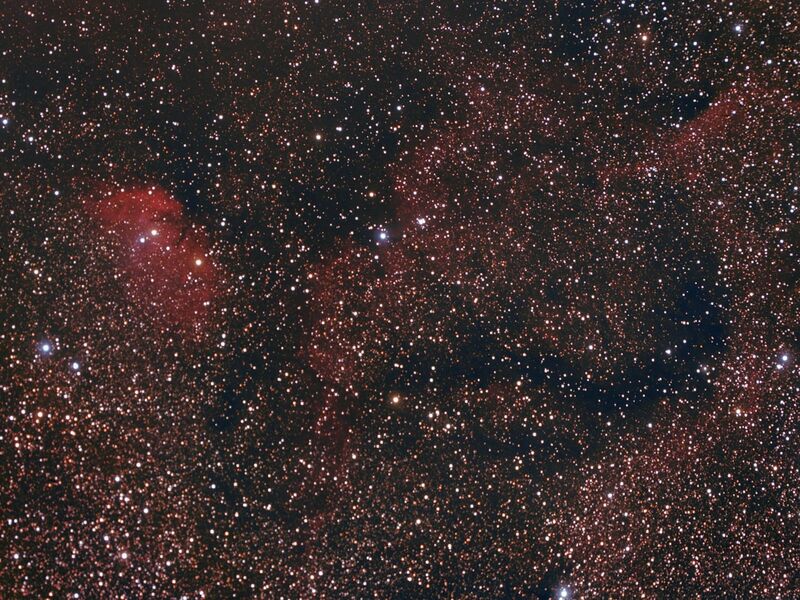 The nebula IC 4628 in the constellation of Scorpius is a HII region filled with gas and dark dust.The nebula can be found just north of NGC 6231 and south of Antares, in the tail of Scorpius. 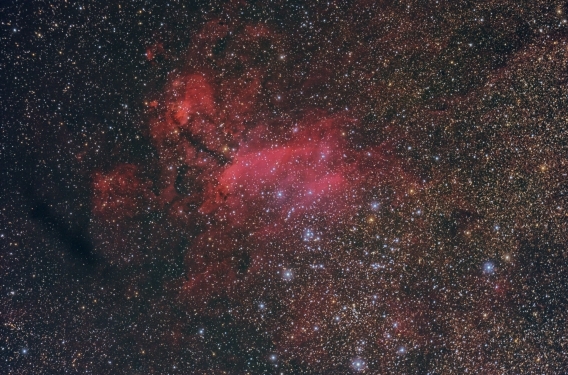 IC4628, also called the Prawn Nebula is around 250 light-years across, covering an area of the sky four times that of the full Moon. 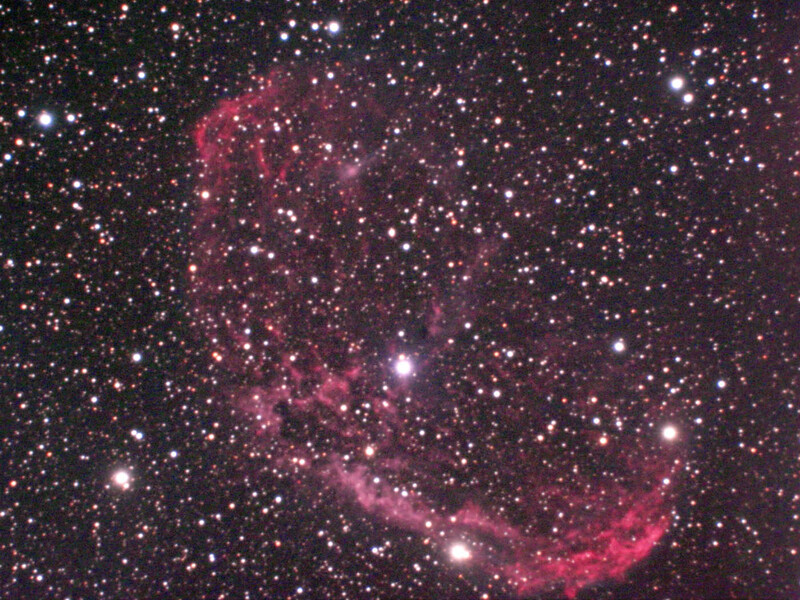 The nebula is also named Gum 56, after the Australian astronomer Colin Gum, who published a catalogue of HII regions. 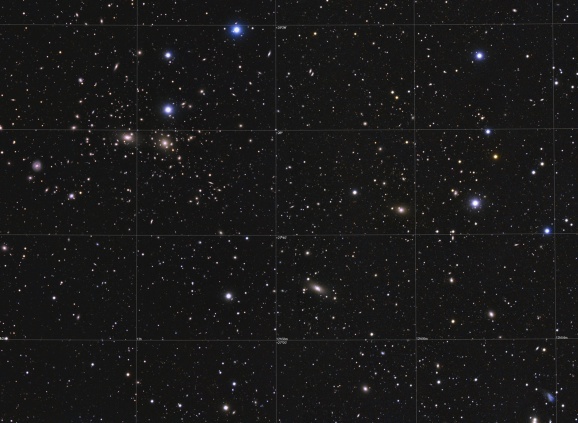 Collinder 316 which is visible in the lower right middle of this image. 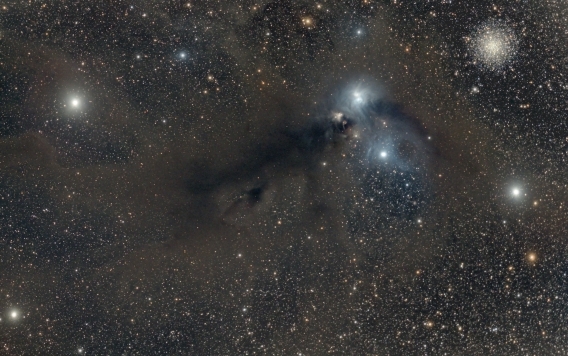 Corona Australis Molecular Cloud Region. 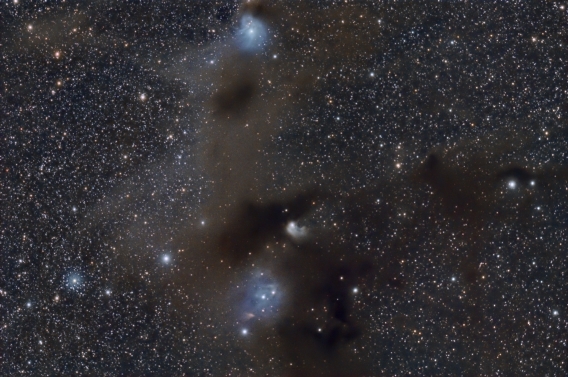 NGC6729 is a Reflection and Emission Nebula (star forming region) and reflects the light of the variable star R Corona Australis. 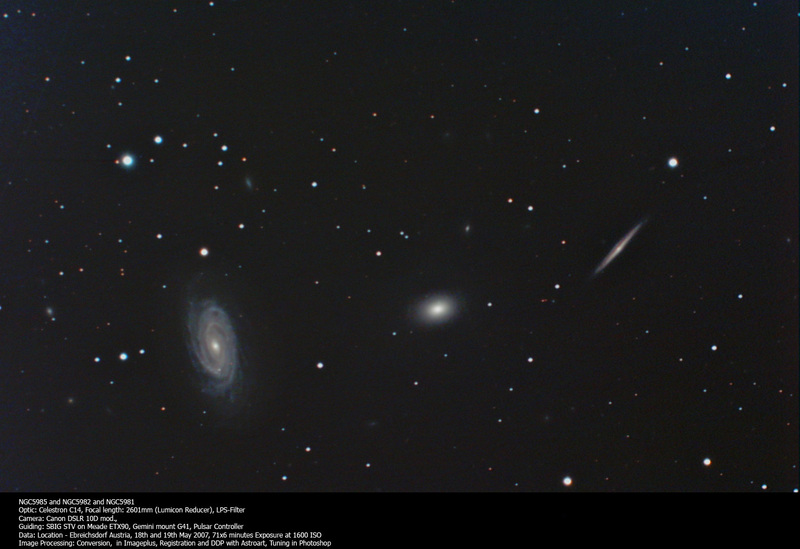 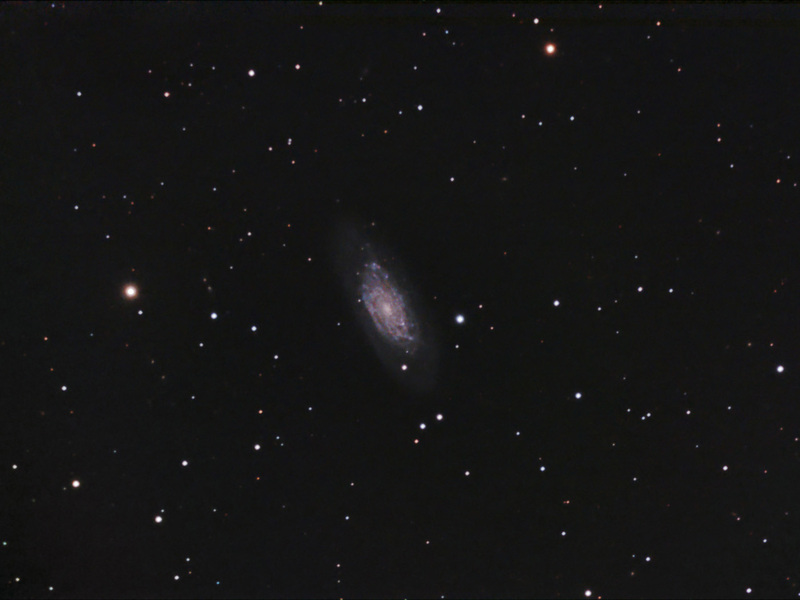 Also some PGC Galaxies can be seen in the larger image. 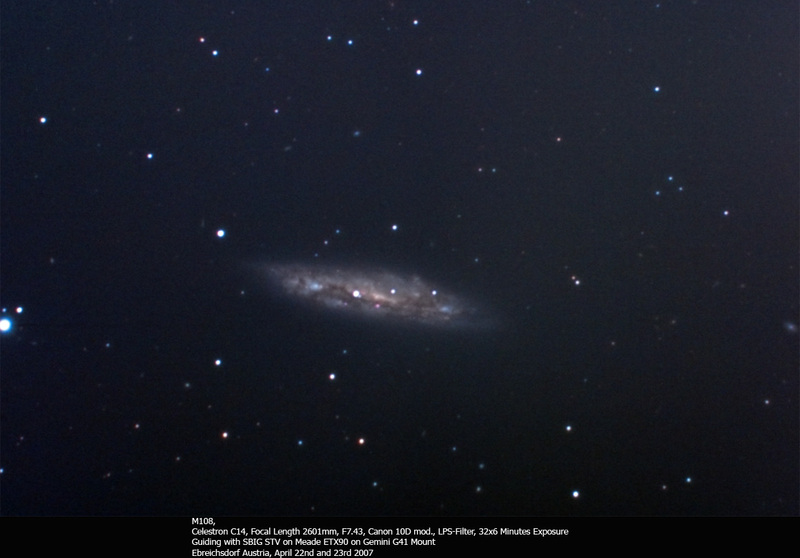 All images were exposed at Astrofarm Kiripotib Namibia in May 2014. 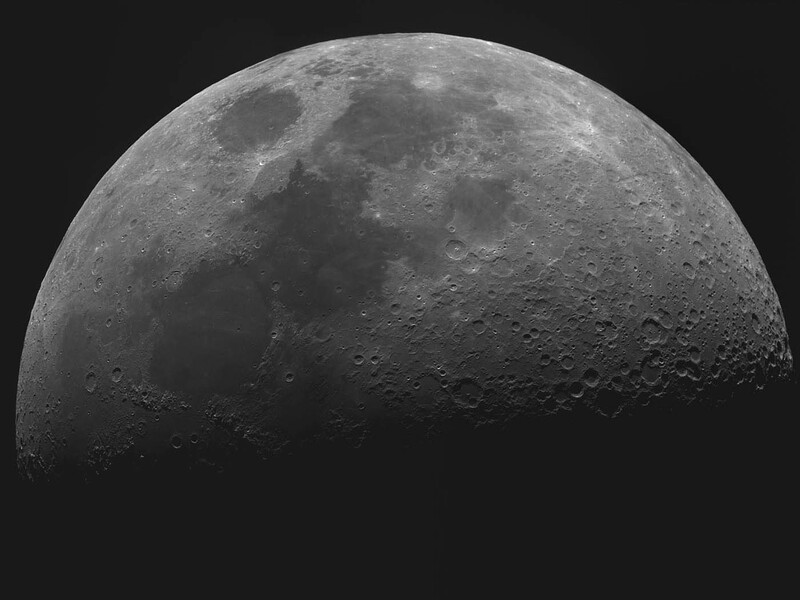 Dec -36°56'02" South and RA 19h02m53s. Distance approx. 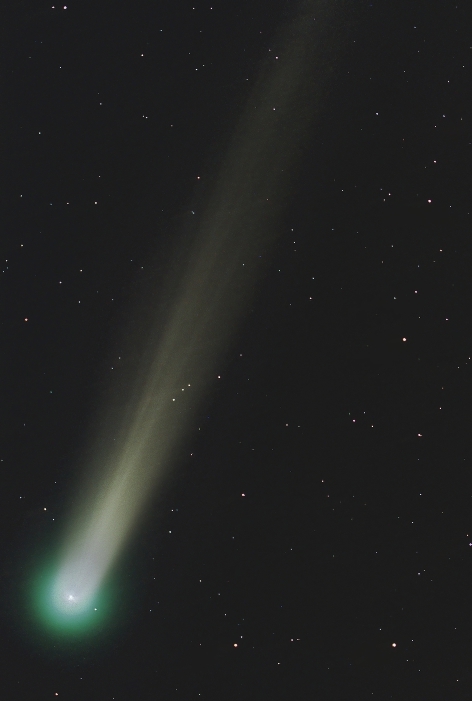 400 light years. 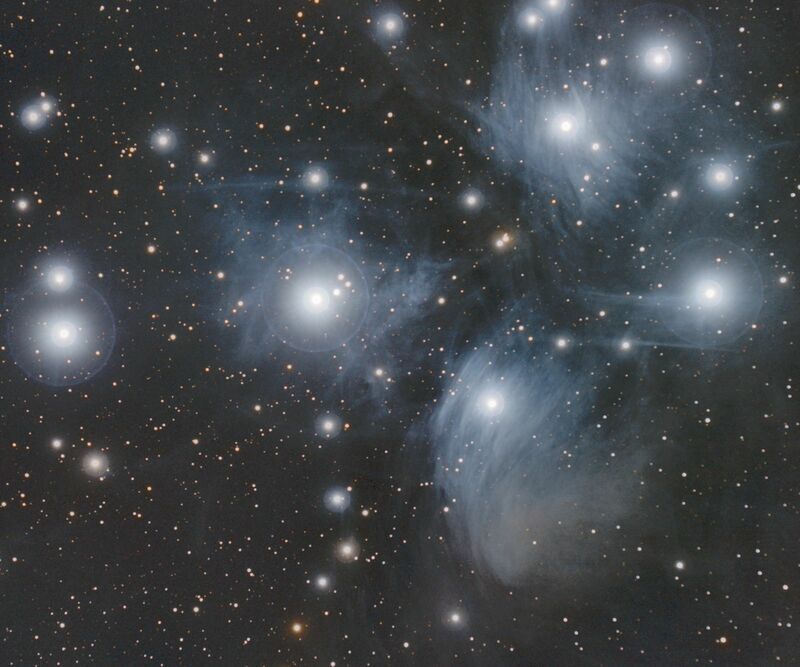 These object is located in the Southern constellation Centaurus, Dec -47°33'06" South and RA 13h27m38s. 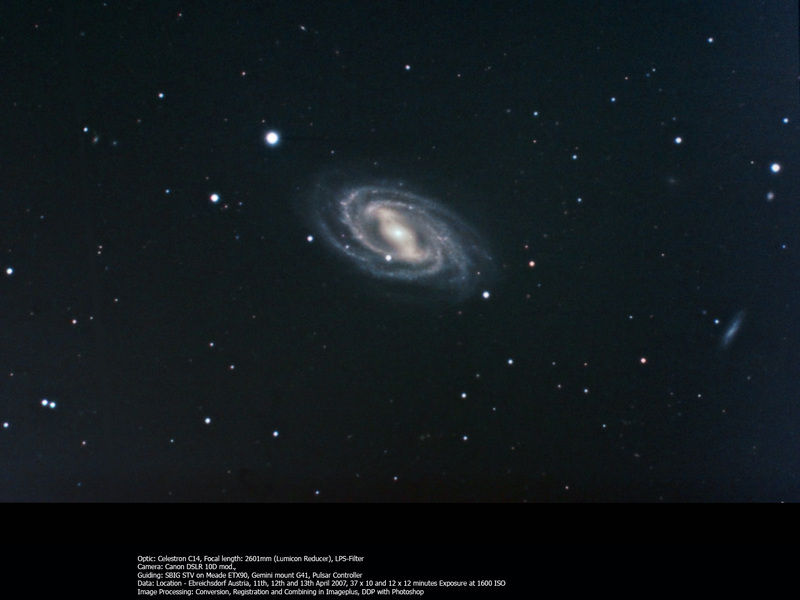 Thanks to team of the Astrofarm Kiripotib Namibia, especially to Rolf Scheffer!! 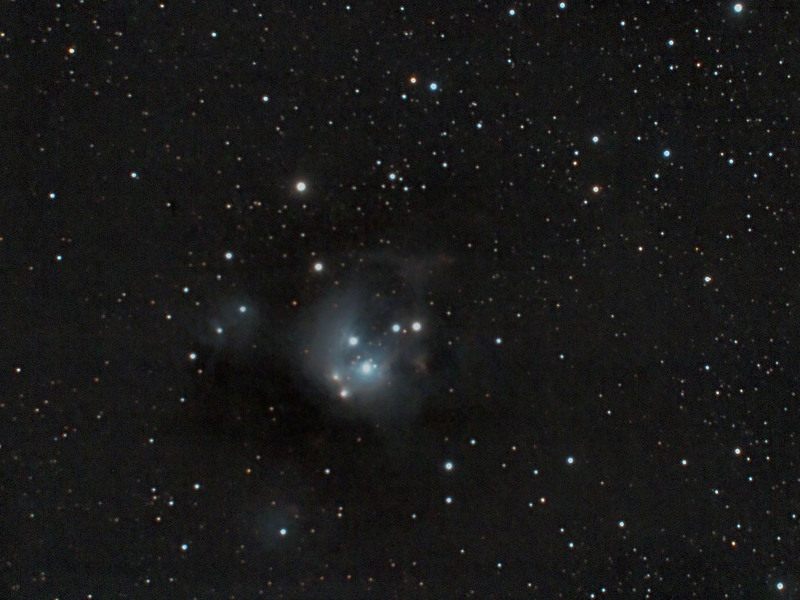 All images were exposed at Astrofarm Kiripotib Namibia May 31st 2014. 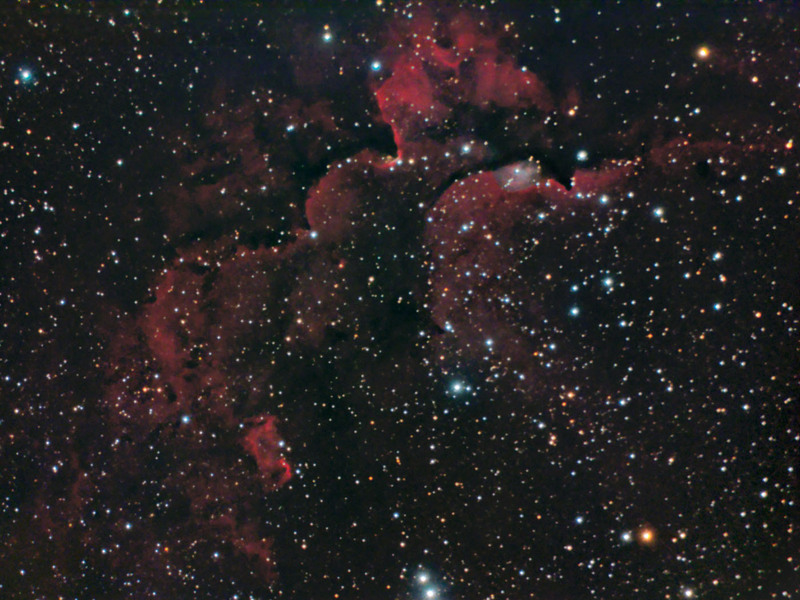 NGC3372 itself is a large cloud complex in the milkyway that includes some dark nebula too. 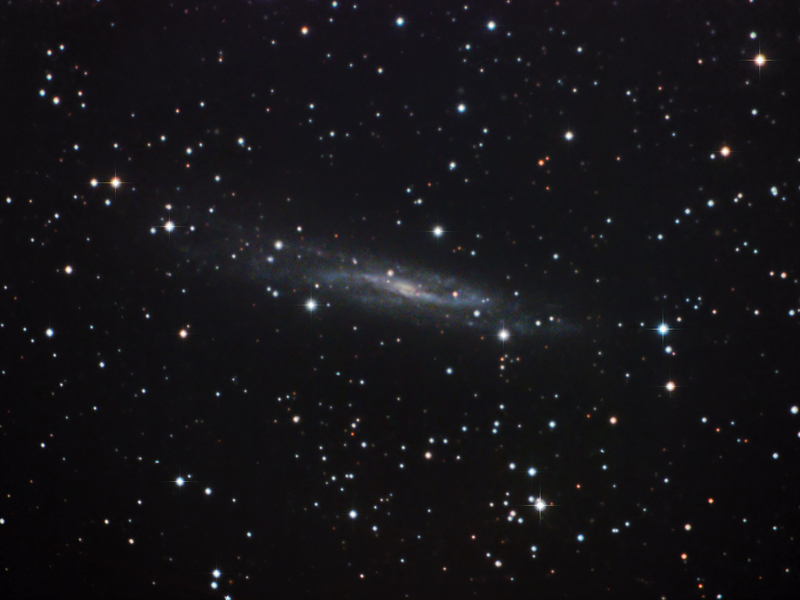 Wider than the full Moon this objects stretches over more than 300 light years. 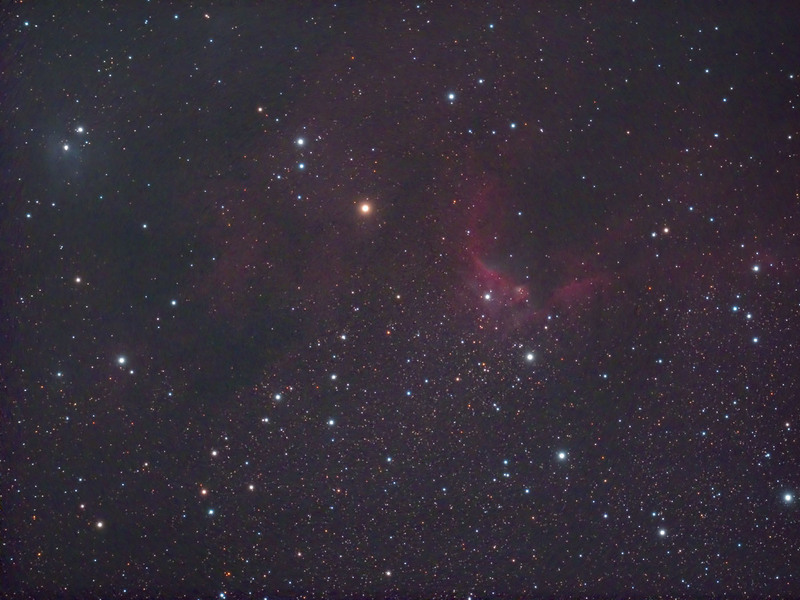 the variable star Eta Carina above the center to the left of the Keyhole Nebula. 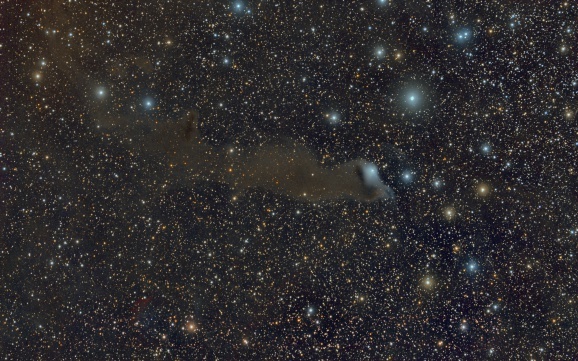 It contains also dark clouds with starbirth places (HMSTG-). 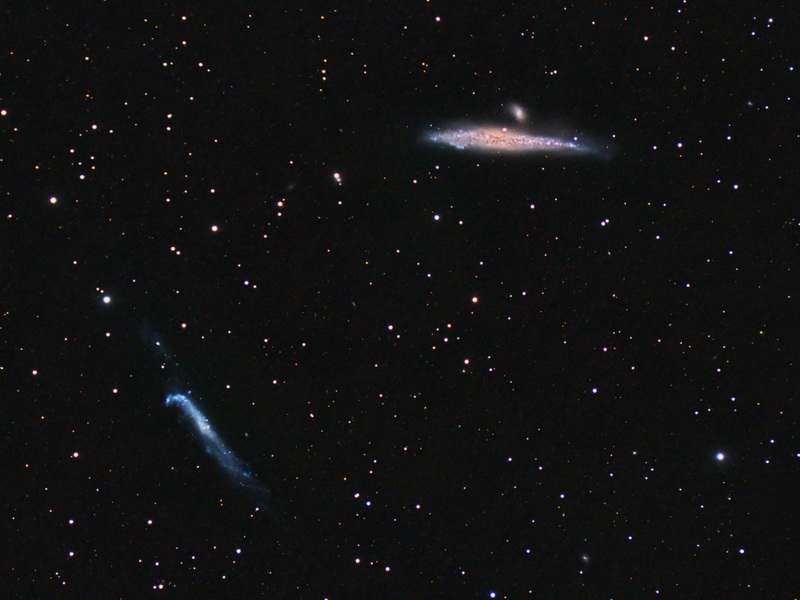 Find more details at my travel report - Skywatch_Namibia_2014. 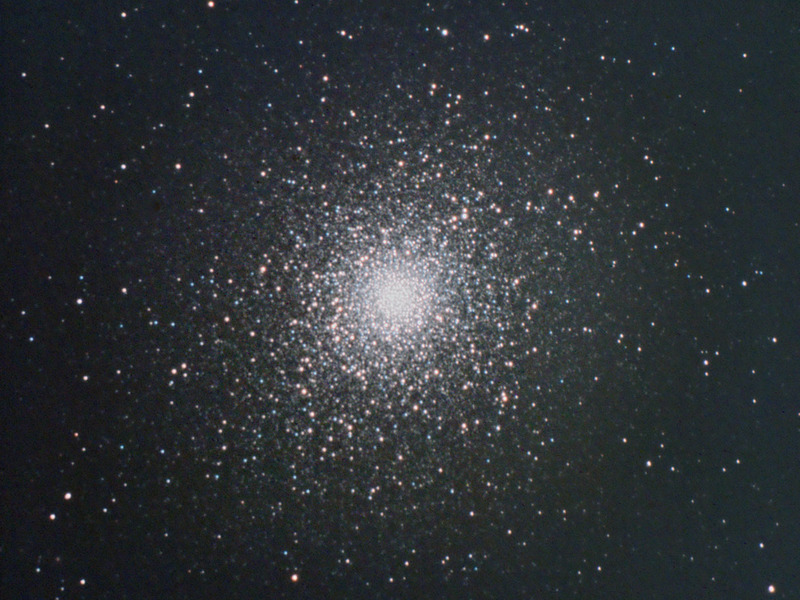 in Ebreichsdorf/Austria November 30th, Dec 1st and Dec 2nd, 2013.
in Ebreichsdorf/Austria July 7th, 8th, 9th and 10th, 2013.
in Ebreichsdorf/Austria June 13th 2013.
in Ebreichsdorf/Austria April 16th 2013 3 to 5 AM. 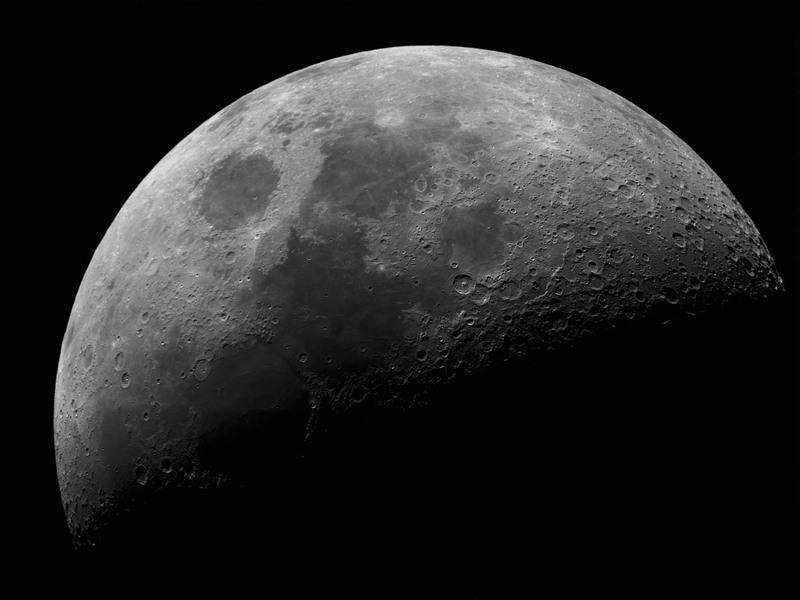 in Ebreichsdorf/Austria August 18th/19th/20th/21th 2012. 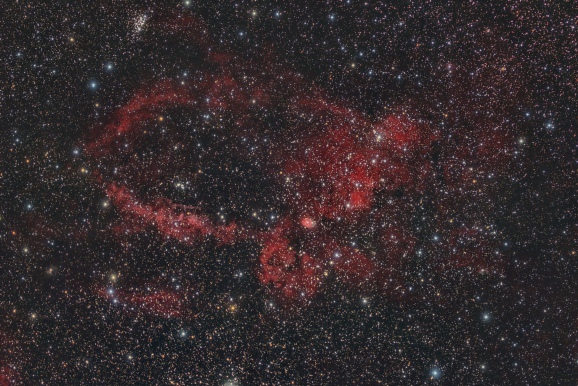 VdB149, VdB150 are reflection nebulae visible in the constellation Cepheus. 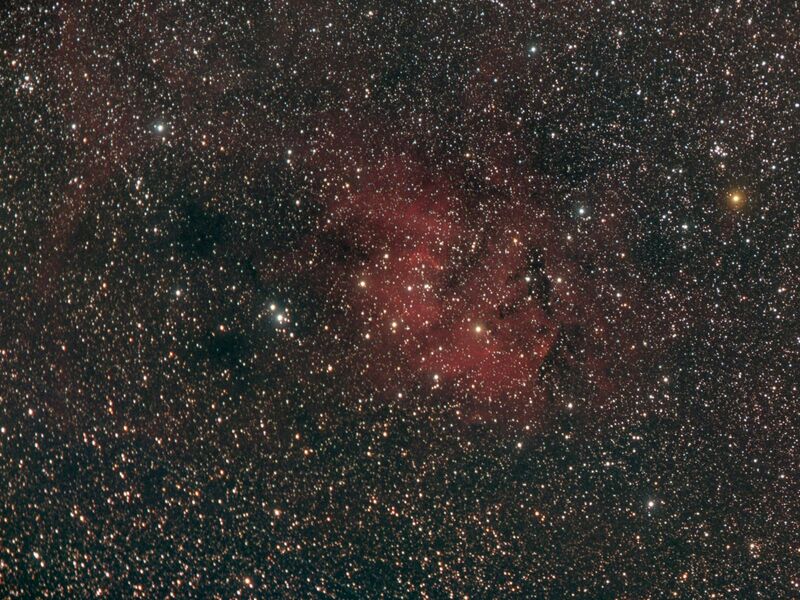 This very faint nebulae in Cepheus are a challenge even for Hyperstar with OSC camera. 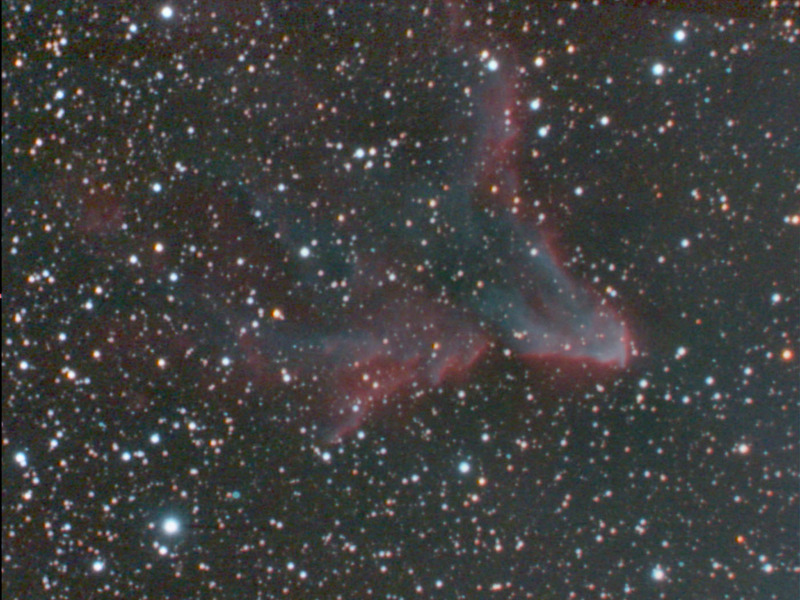 The VdB150 nebula is the blue nebula at the top, while the other blue one on the bottom is VdB149. 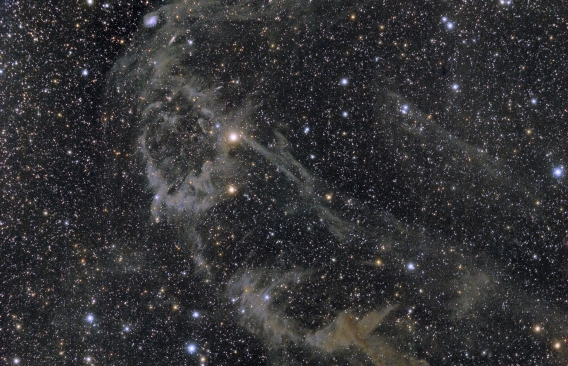 The large dust nebula is catalogued as LBN 535. 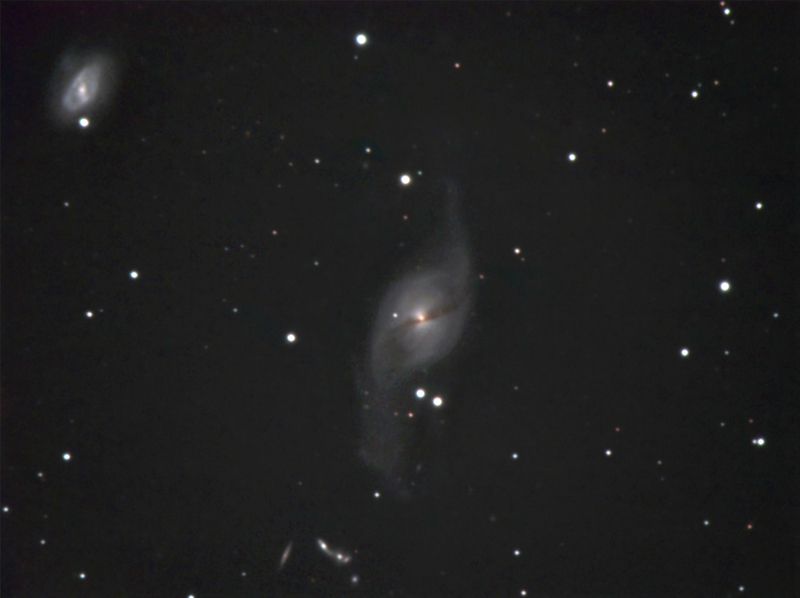 On the right the PGC 67671 galaxy is visible through the dust that is absorbing its light and making yellowish. 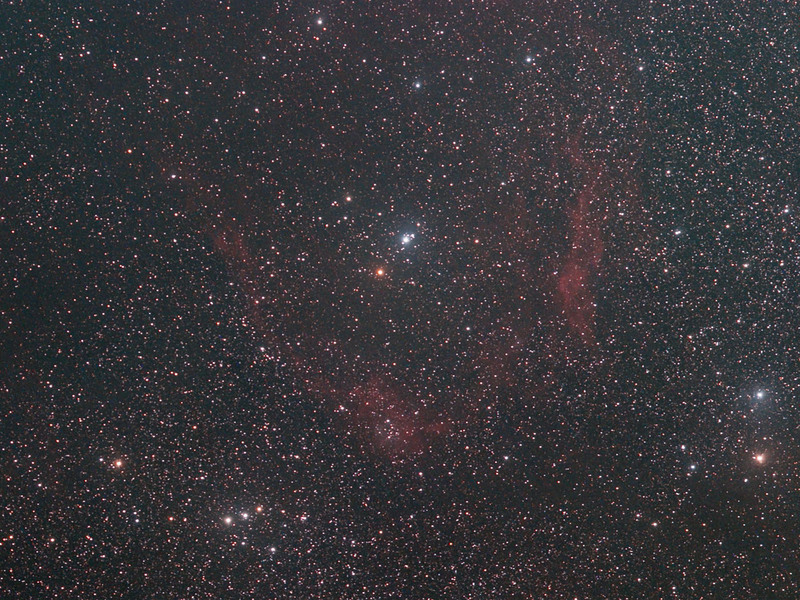 The seventh magnitude star HD 210615 orange, visible south of VdB149, is not part of the region. 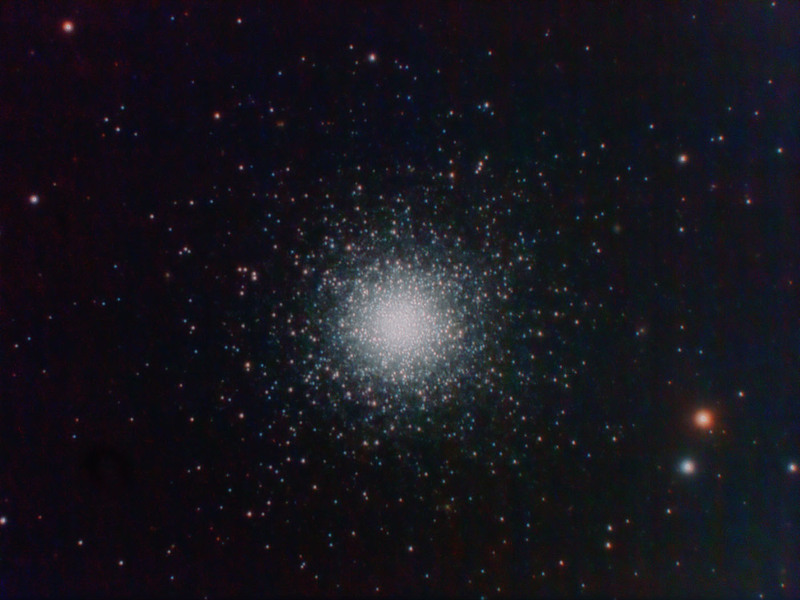 23 x 10 Minutes exposure H-Alpha 35nm filter same optics. 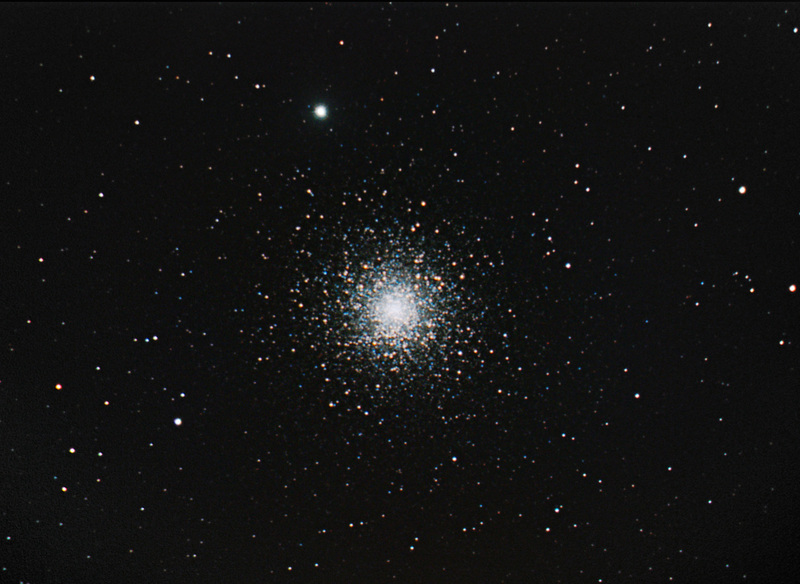 in Ebreichsdorf/Austria August 12th/13th/14th/15th 2012. 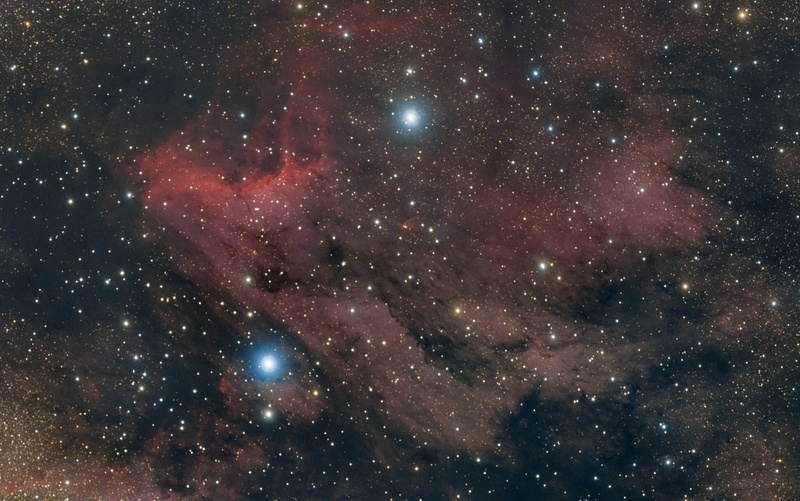 The nebula is located in the western part of the constellation Cassiopeia, on the border with Cepheus. 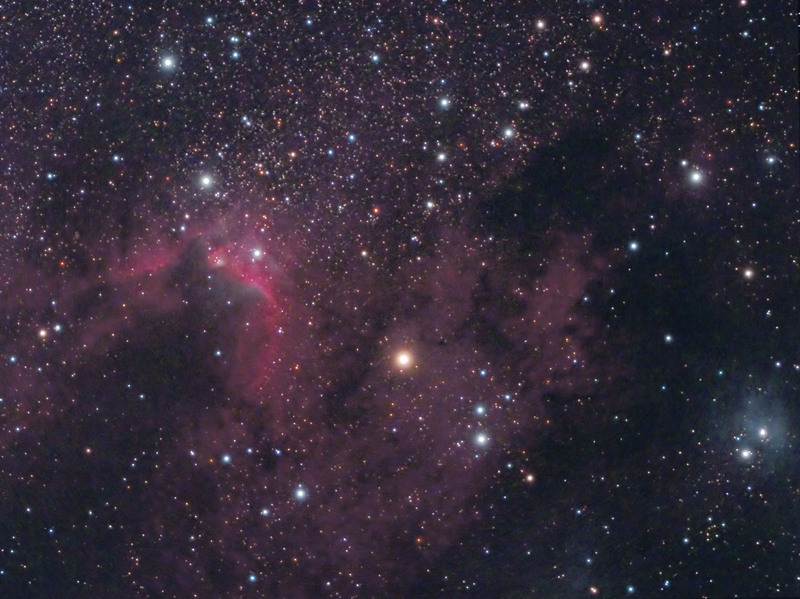 Sh2-157 can not be observed optically, therefore neither a pair of binoculars or an amateur telescope are able to show it, it can be reflected only in a long-exposure photograph. 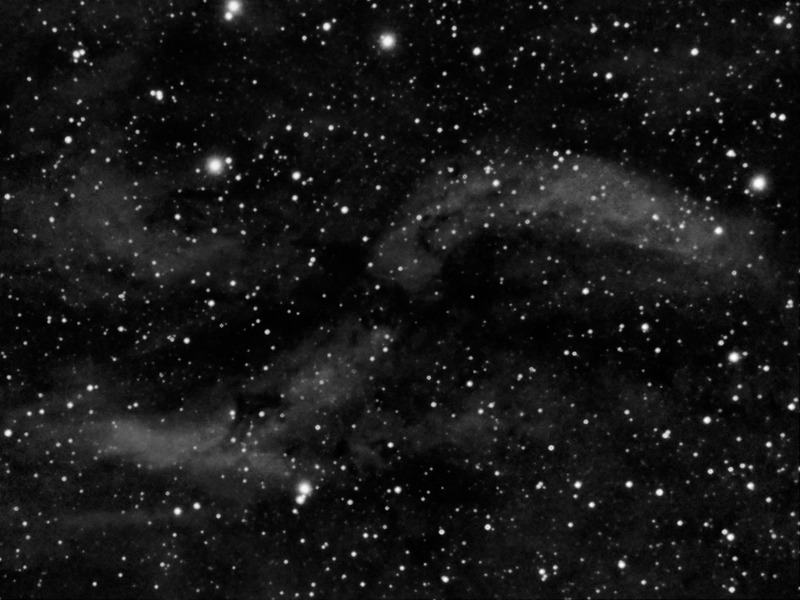 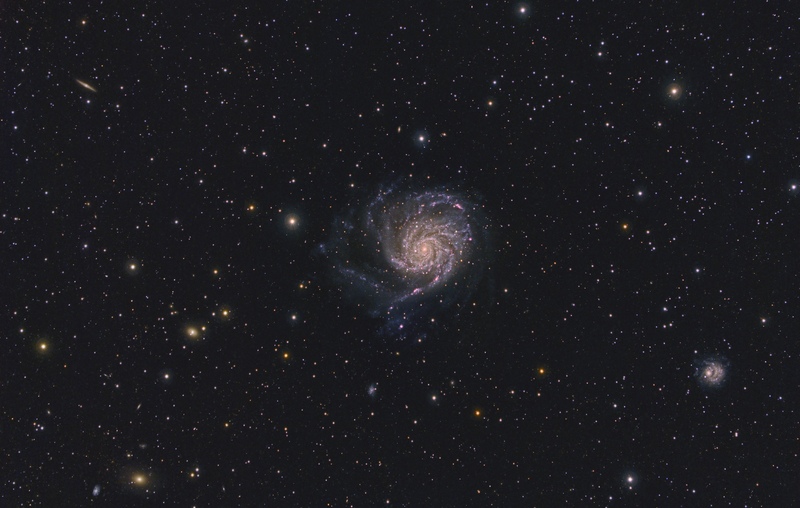 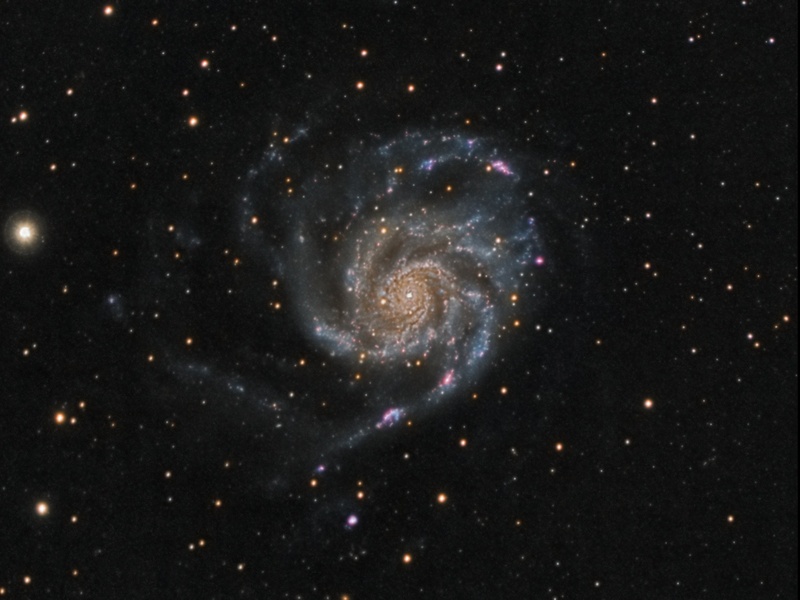 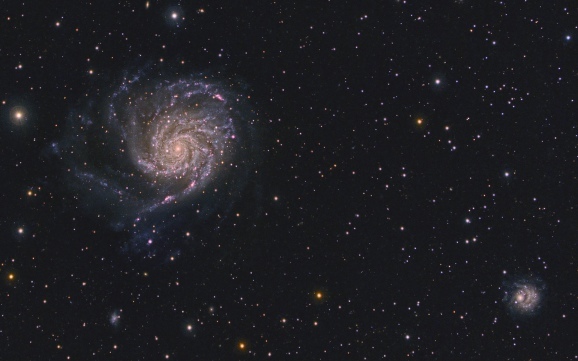 It shows a large and faint nebulosity widespread, with brighter regions in the center and a large arc to the north. 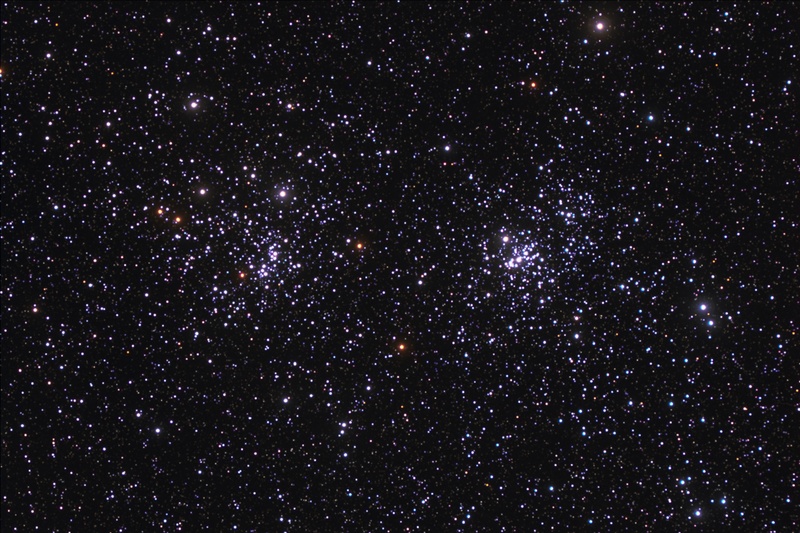 In the background are rich star fields, on which stands, in a northwesterly direction, the open cluster NGC 7510, well observable with binoculars. 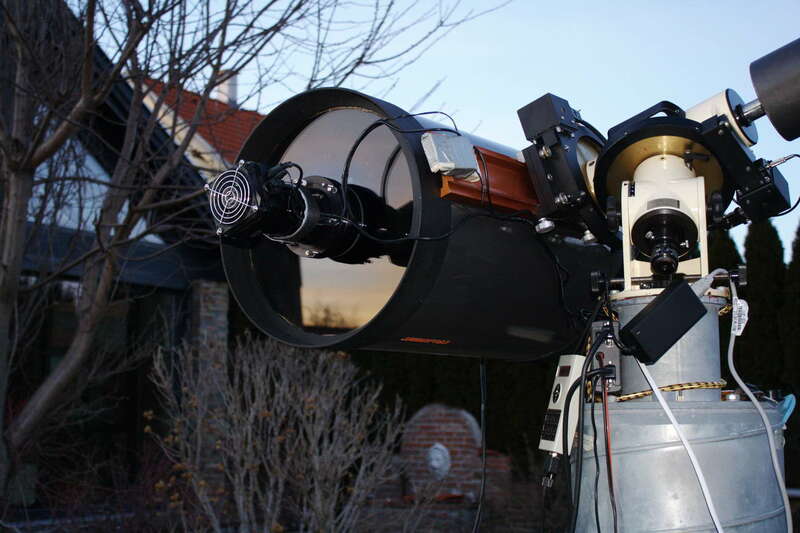 For a complete list of the Sharpless Catalog visit http://www.sharplesscatalog.com. 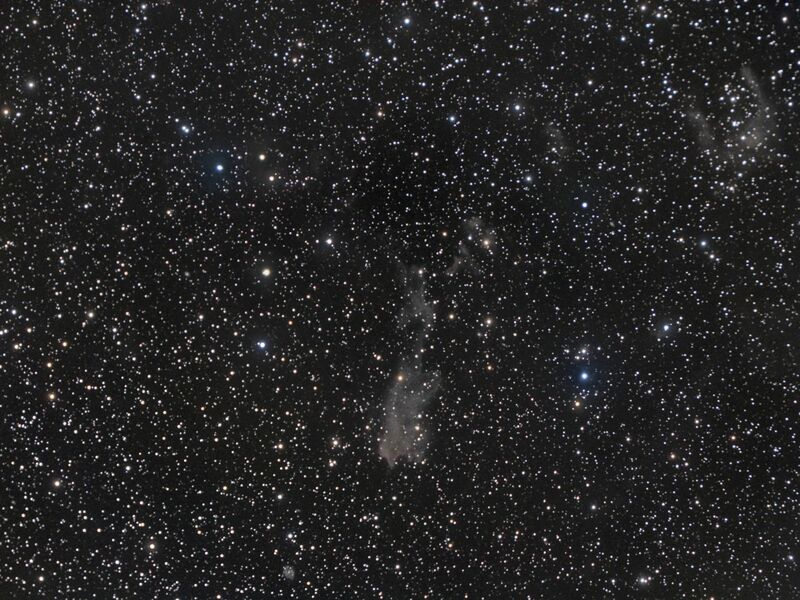 Described as a dusty curtain or ghostly apparition, mysterious reflection nebula vdB 152 really is very faint. 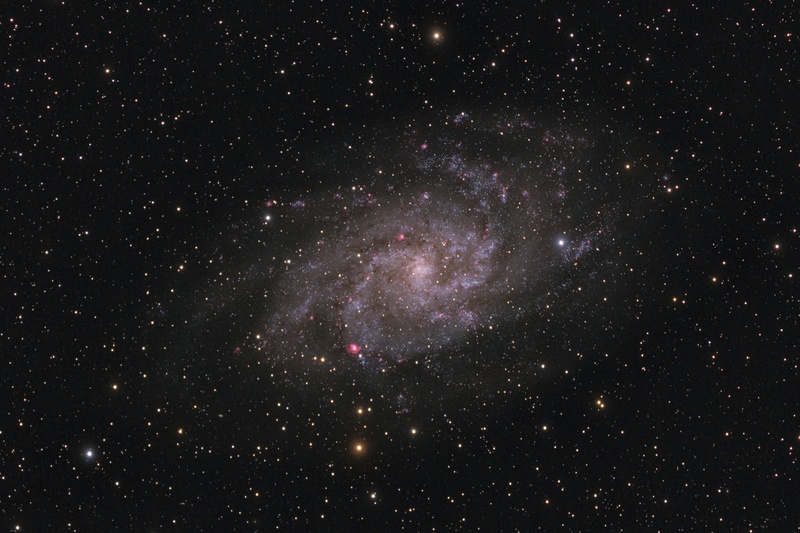 It lies about 1400 light-years away, along the northern Milky Way in the royal constellation Cepheus. 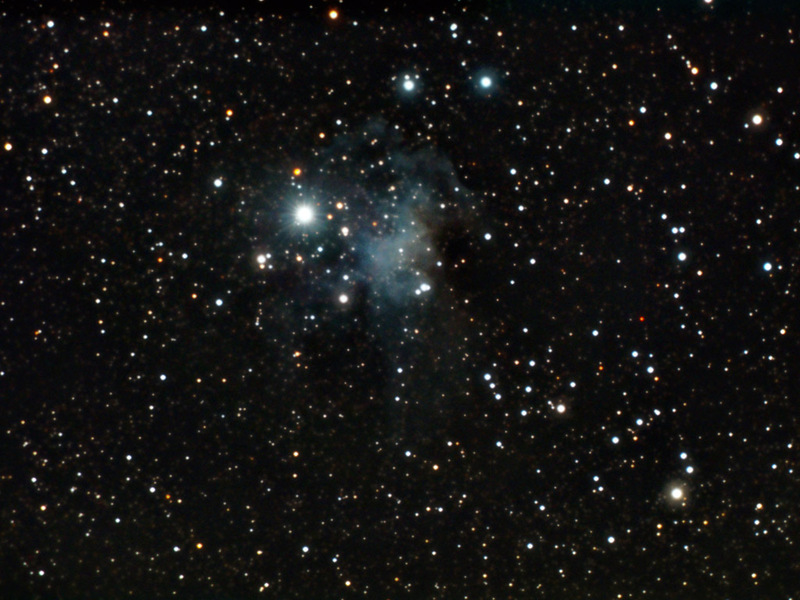 Near the edge of a large molecular cloud, pockets of cosmic dust in the region block light from background stars or scatter light from the embedded bright star (mid-right) giving parts of the nebula a characteristic blue color. 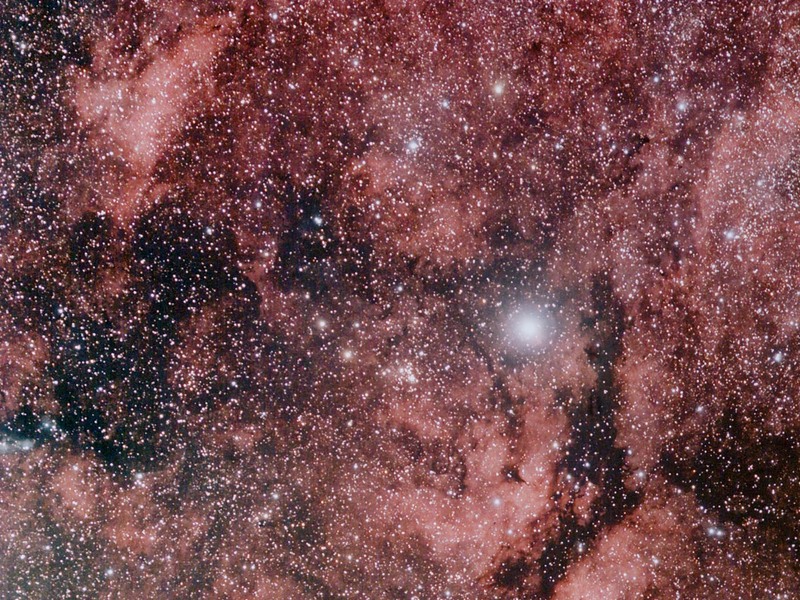 Ultraviolet light from the star is also thought to cause a dim reddish luminescence in the nebular dust. 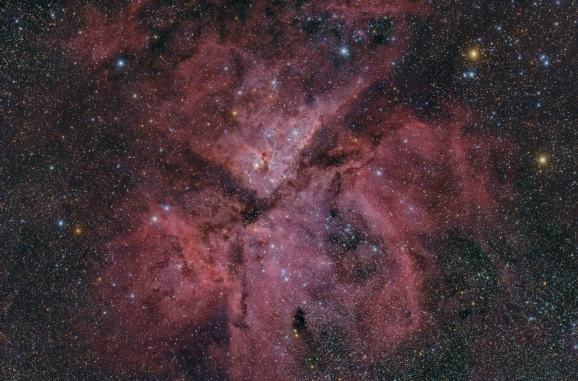 Though stars do form in molecular clouds, this star seems to have only accidentally wandered into the area, as its measured velocity through interstellar space is very different from the cloud’s velocity. 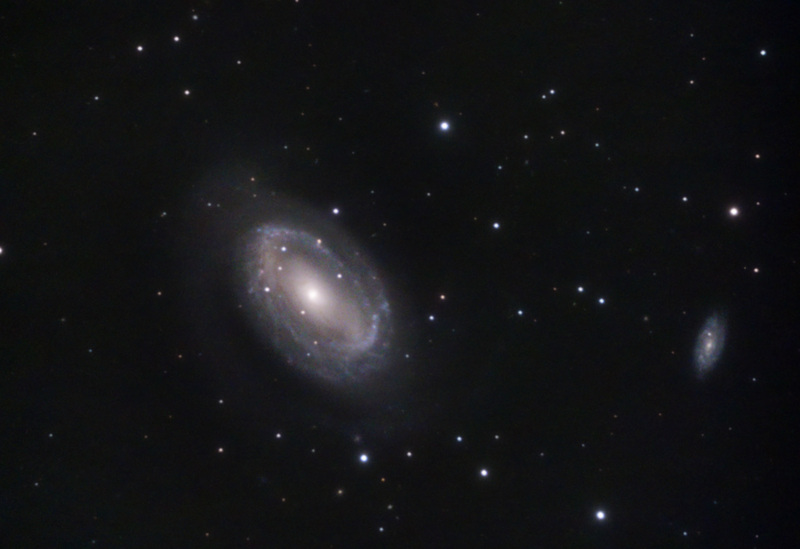 This deep telescopic image spans about 7 light-years at the estimated distance of vdB 152. 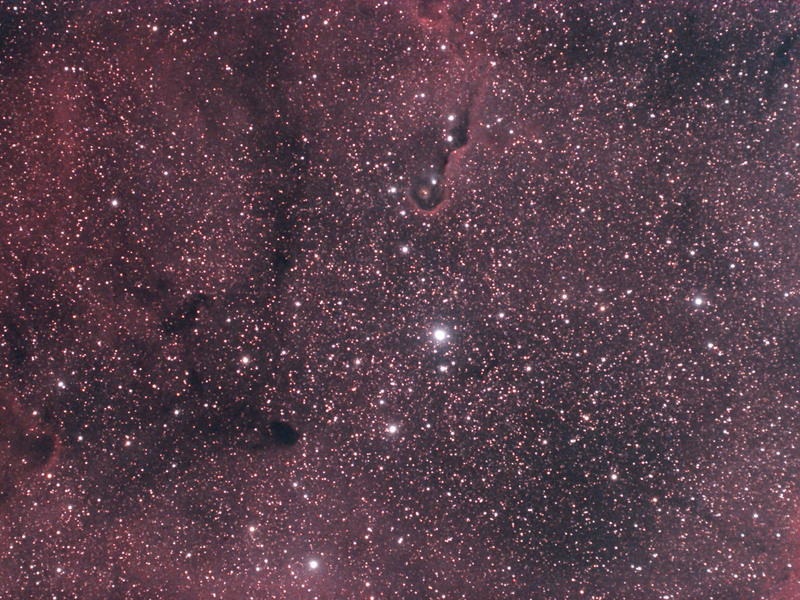 Klick for 100% Widefield 3200x2030 pixel. 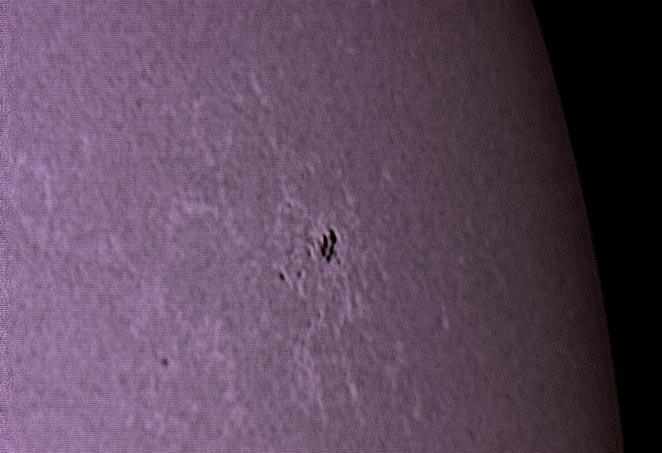 Cooperation between Dr. Franz Gruber and me, April 2012.
f/2 in Ebreichsdorf/Austria by me. 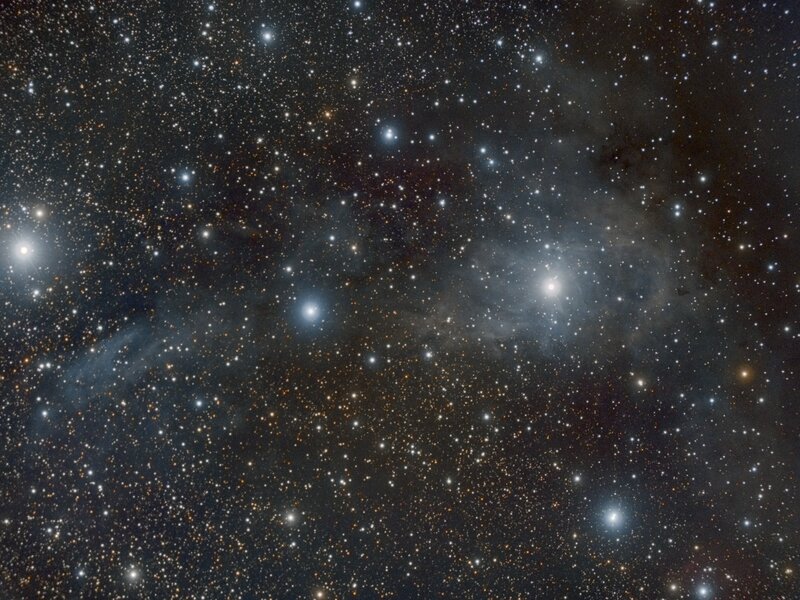 constellation Ursa Major. 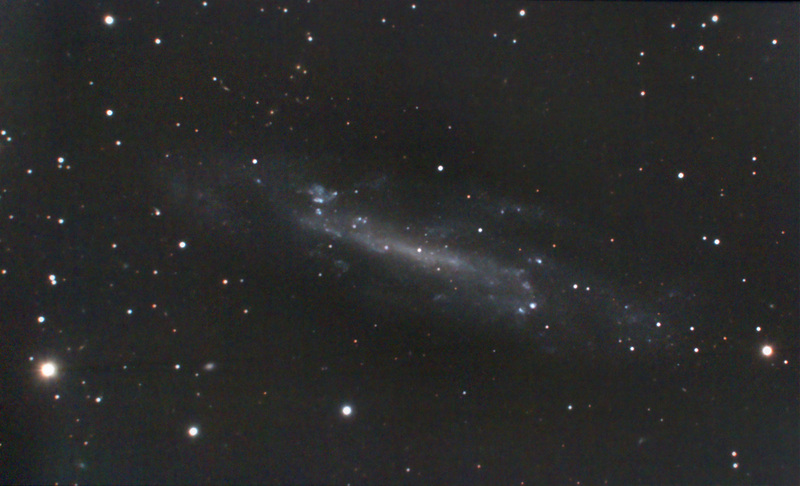 In the annotated image you can find the pointer to the Supernova SN2011fe which is still visible since August 2011 as a small blue dot. 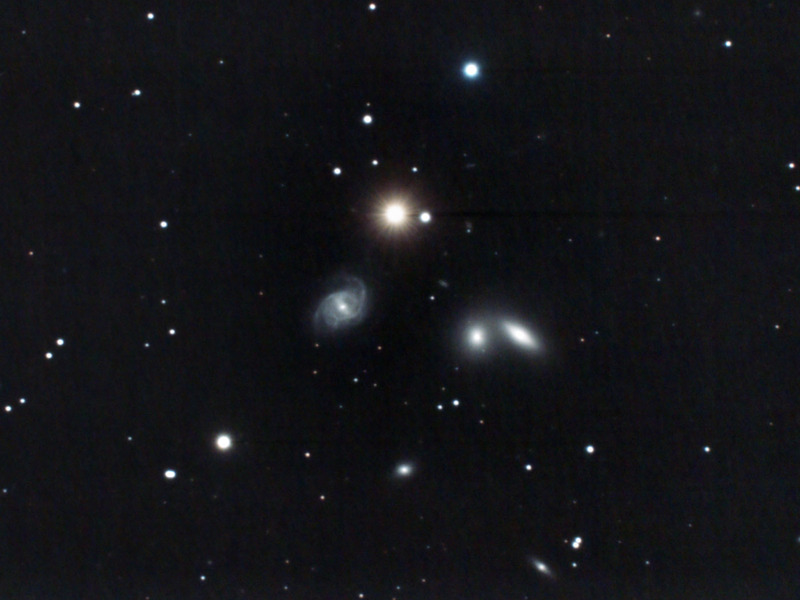 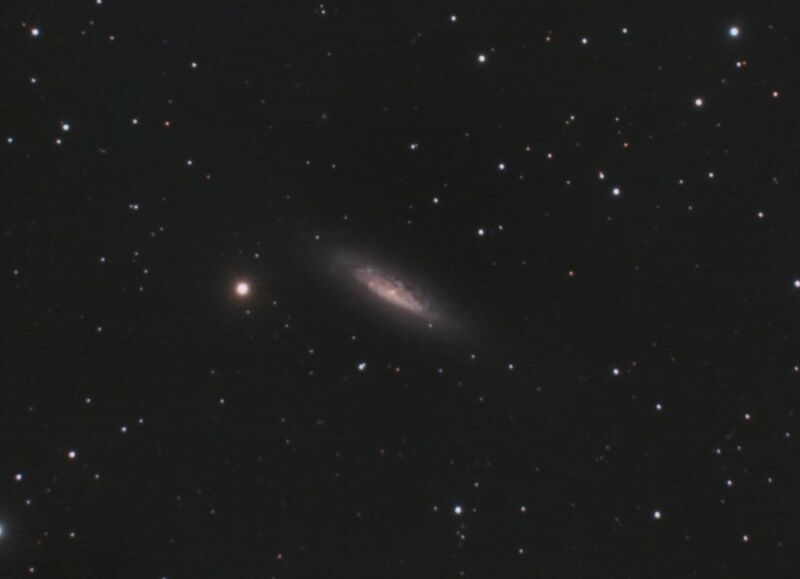 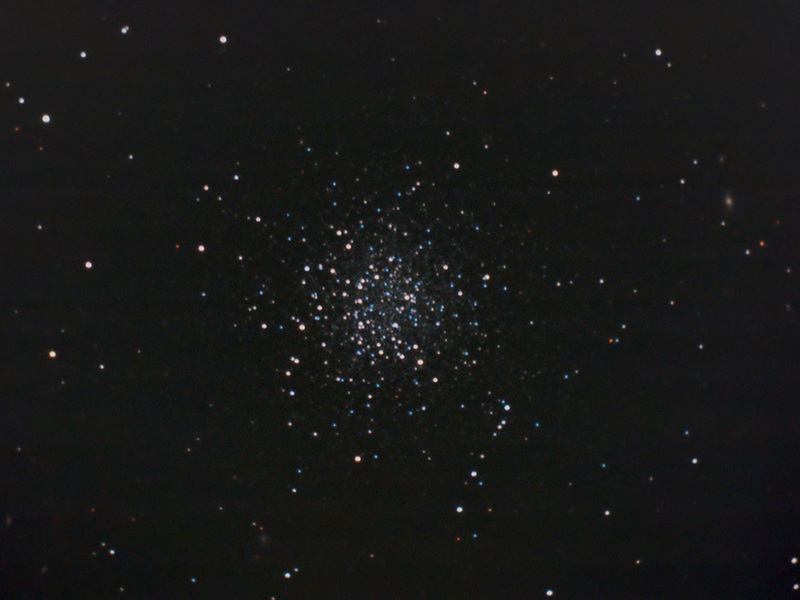 Mosaic is centered at NGC4871. 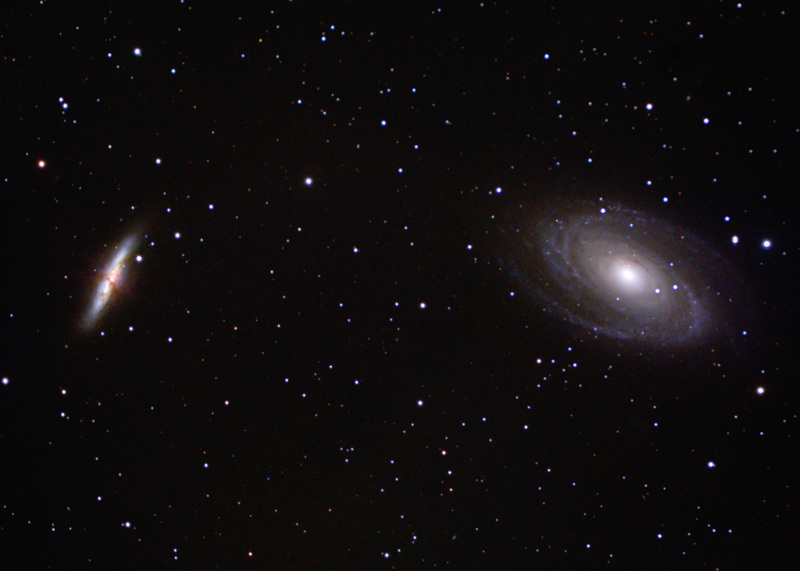 Cooperation between Dr. Franz Gruber and me, March and April 2012.
click here This images were the first made with the New Hyperstar on my C14. 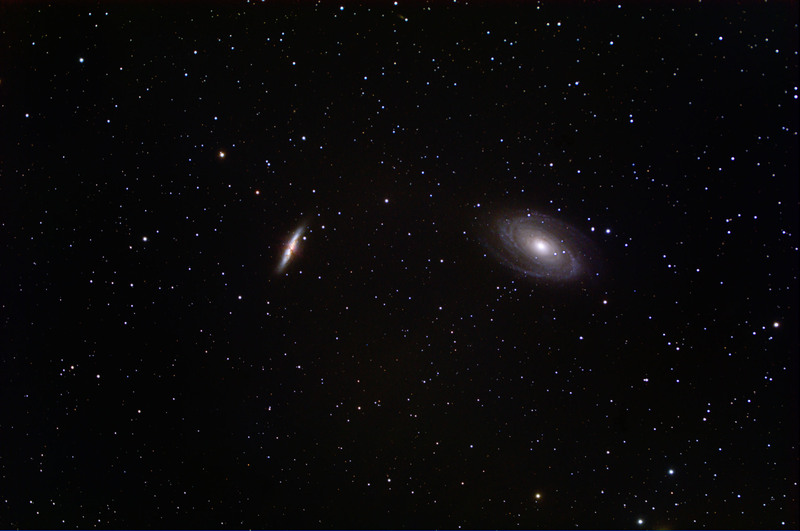 3 stacked images used for Panorama. 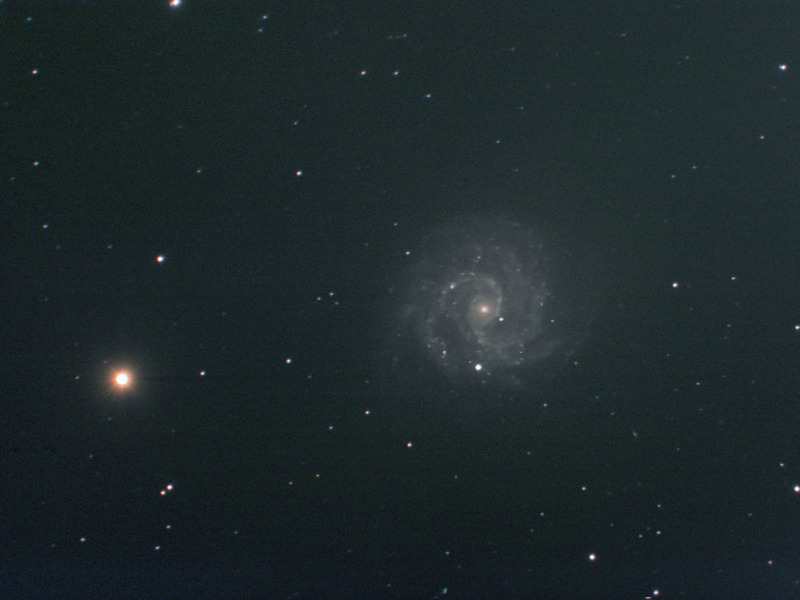 2 stacked images used for Panorama. 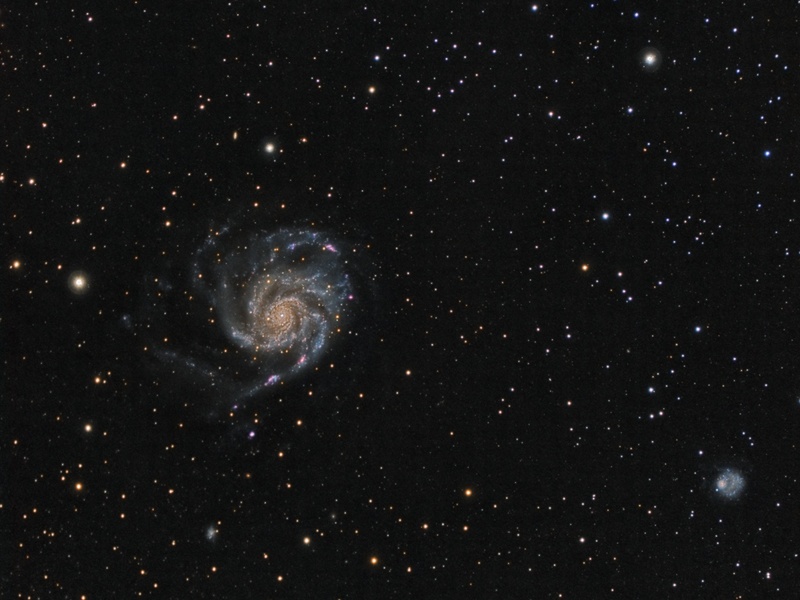 by Dr. Franz Gruber and me.